Saturday was originally going to be just Victoria and myself but a mutual friend, Megan, called and said she had gotten tickets. Megan was another Gilman House resident during the ’05-’06 school year at UW-Madison. Victoria and Megan stayed in the dorms during their sophomore year and became roommates for the ’06-’07 school year. Megan just graduated from UW’s pharmacy school, and she’s going to be working at the VA hospital in Madison as a pharmacist. Megan is a twin, and it just so happens that her boyfriend is also a twin. Her boyfriend Alex, however, is a Twins fan (he’s from Minnesota). He lives in Madison and is working towards his doctorate degree in engineering. I will give him credit though; he pays for the MLB.TV service so he can stream the Twins games. Even though they’re the enemy six games a year, I can respect his fan-hood. Megan and Alex met Victoria in Madison, I met them in Johnson Creek, and we rode to Milwaukee together. Alex’s brother Mike, who was in town for Megan’s graduation, was driving separately since he was flying back to California on Sunday. Alex and Mike wound up in the general parking lot because they thought that’s what we had, so they had to walk over and meet us in the Braves Lot. We had a few beers and before heading in we had a passerby take a picture for us. Going left to right it’s Megan, myself, Victoria, Alex, and Mike. We went to the upper deck together since that was where the three of them were sitting, but parted ways as we headed over to section 440 for the last picture from the terrace level. It’s going to get a lot more tricky to get a good picture from the loge level. Mainly because 20 minutes before the game there will be many more people in the front row of the loge level than there are in the terrace. Victoria and I then made our way down to section 221 and got situated for the game. We did make sure to stop by and say hi to the Ice Man (the beer vendor), and Bill (the friendly usher above section 216). The game got underway and it started out nicely, as Yovani Gallardo retired the first three Twins in order, and only needed nine pitches to do so. There wasn’t any scoring until the fourth inning, when the Twins pushed one across via the sacrifice fly. The Brewers answered in the bottom half after Nyjer Morgan singled, stole second, then eventually scored on a Lucroy single. The Twins scored a solo run in the sixth on another sacrifice fly. 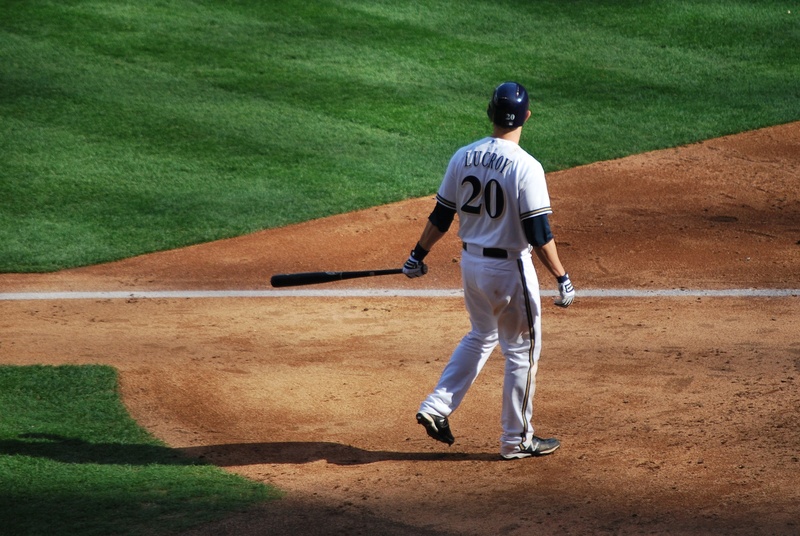 The Brewers answered again with a run in the bottom of the sixth on a Ryan Braun RBI single. Solo runs by the Twins in the seventh and eighth inning gave them a 4-2 lead, and things were looking bleak. Aramis Ramiriz came through in the clutch with a two out, two-run home run in the bottom of the eighth. 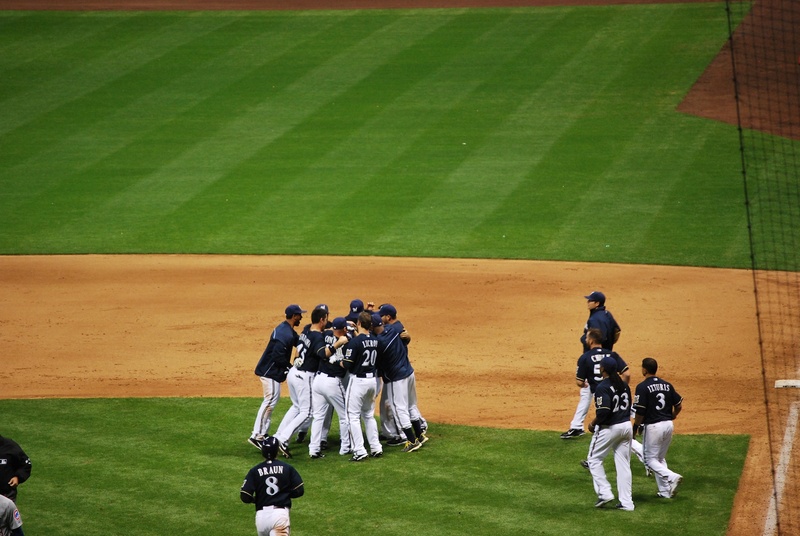 The game went to extras after both teams failed to score in the ninth, but the Twins got a home run in the top of the eleventh, and the Brewers went quietly in the bottom of the inning. It was exciting towards the end, and nice to see that the Crew fought back, but a loss is a loss, and the losing streak has reached four games now. 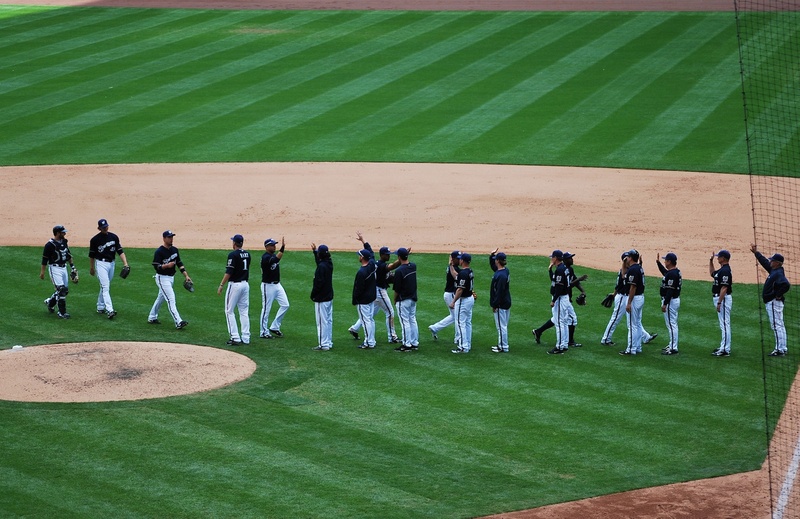 Final Score: Twins 5 – Brewers 4. Greinke is on the hill tomorrow and I’m hoping he can be the stopper once again. This last picture was taken when Lucroy was coming to the plate in the bottom of the sixth. The sun was coming through the windows on the first base side in the upper deck, and created some nice long shadows on the field. I missed two pitches during the game, and although it’s upsetting, it makes sense. The same thing had happened earlier in the year, and old habits are hard to break. In the past, when I would see the first pitch of an intentional walk, I would let my eyes wander until after he reached base, because I knew what was happening, and didn’t need to watch it. I did that twice at this game, starting with the 1-0 pitch to Morneau in the top of the sixth. Apparently I didn’t learn my lesson because I did the same thing in the bottom half, when Lucroy was intentionally walked to get to the struggling Rickie Weeks. That’s all for now. Tomorrow is a new day and I’m holding out hope that the boys can turn it around. I got up in Houston at 7:30 am, spent two hours in St. Louis, and went to bed in Fort Atkinson at 1:15 am this morning. It was a long day, but surprisingly I wasn’t that tired when I got in bed. It could just be fear of a possibly disastrous season ahead for the Crew, or that I’m worried about the upcoming trip to Phoenix and Los Angeles. Back to Houston: I made it to the bus stop (located just three blocks from my hotel) seven minutes before I thought the bus was to arrive. My iPhone (google maps) told me that it would depart for the airport at 8:41 am, and I was there by 8:34. A few buses appeared in the distance and I got my hopes up. I needed the 88 bus and the three that passed in the time I was waiting were not said bus. I started getting nervous as my watch ticked past 8:40, and 8:45. I always think that when a bus is late it was just really early, and I already missed it. Finally at 8:50 the bus showed up. I’m starting to think that Google maps just doesn’t have updated schedules, because on the weekends the route says it picks up from that spot at 8:50, so I’m guessing it is now the same for weekdays as well. My flight to St. Louis touched down at 12:55, and I had plenty of time to spare before my 3:20 flight to Milwaukee. I was nervous when the plane didn’t show up at the gate until 2:45, but we departed on time and made it to Milwaukee by 4:20. That was the latest arrival time I had scheduled for any of the return flights, and I’m glad it’s over. The whole morning (and afternoon) I was expecting something to go wrong, and was pleasantly surprised when nothing did. Once in Milwaukee I took I-43 North to I-94 West, and I shouldn’t have. It took 48 minutes to traverse 10 miles. I don’t think there was any construction westbound, and it was just rush hour traffic. 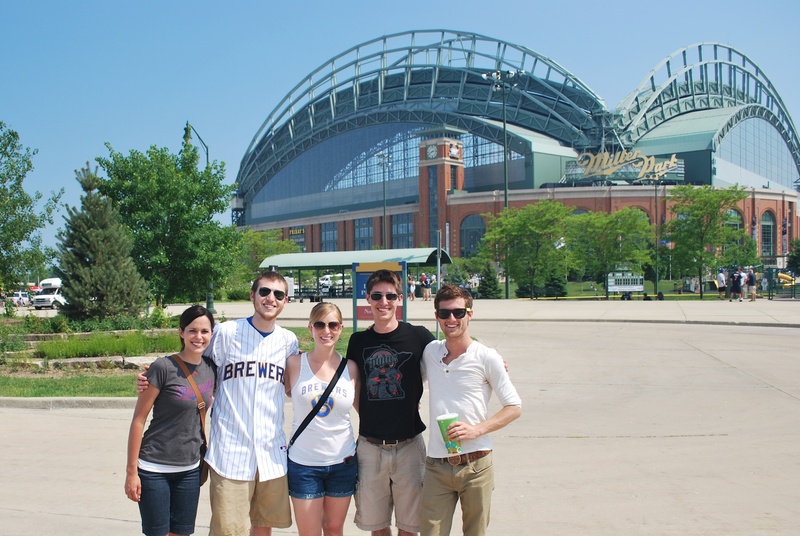 I pulled into the Braves parking lot at 5:37, and was inside Miller Park and in the upper deck shortly thereafter. 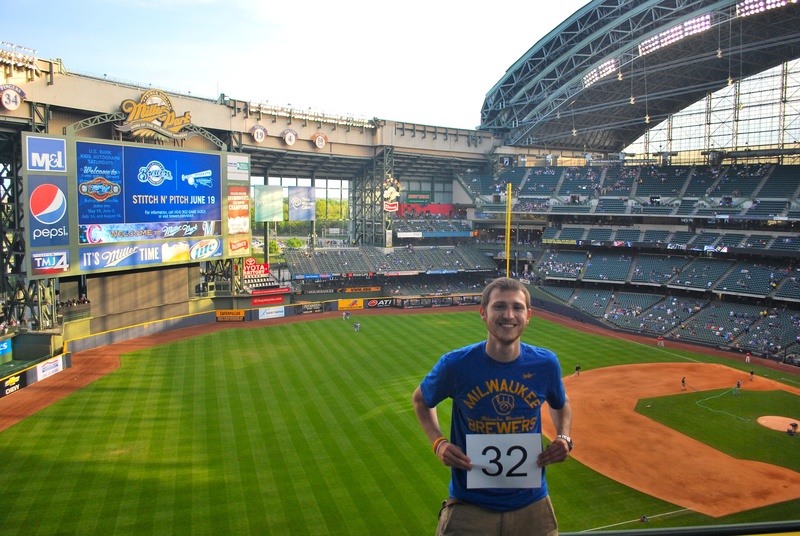 There were no fans to be found way up near Bernie’s terrace, so I had a nearby usher take game photo number 39. Only one more to go in the upper deck! I didn’t have someone to go with for Friday’s game, so I had tweeted earlier that my extra ticket was available for 20 dollars (which I would donate to Be The Match). I received a few inquiries and “awarded” Erica G with the ticket. I sent her my phone number and she called so we could discuss the details. I left it at one of the will call / drop off windows, and she got to the park around 6:20. She lives a few miles away and was able to jump on a Miller Park bound bus right after I confirmed that the ticket was hers. She works at the Meta House, which “helps women struggling with drug and alcohol addiction reclaim their lives and rebuild their families.” I took that right from the website as to not mess something up. Unfortunately Erica went to the University of Minnesota and as a graduate of UW-Madison and a loyal Badger, I had to give her a little grief. 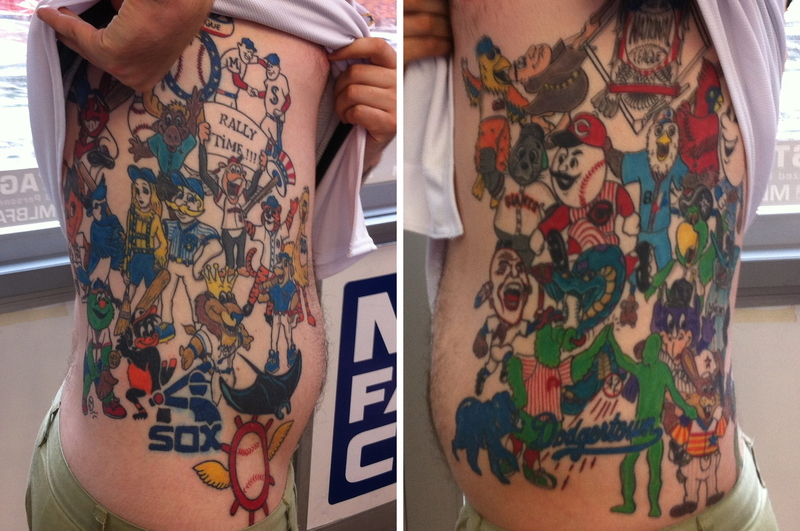 We talked about sports and other topics, and when I talked about possibly getting a ball and glove logo tattoo, she mentioned that she heard of a guy who had all the mascots of every MLB team tattooed on his body. I laughed and said “well you must not read the blog, because I just met that guy three days ago in New York.” I showed her the pictures I took of him (here they are again if you hadn’t seen them). She was a little embarrassed and said she hadn’t been reading, but I think she will now. Yikes. It was not the Brewers’ day. As you can see, the Twins scored in five of the nine innings, and put up crooked numbers in four of them. The FOUR ERRORS contributed to two unearned runs, but even without them it would’ve been a 9-3 game. The Brewers made it a little (stress on the word little) exciting in the ninth inning, when they loaded the bases with one out. However, a strikeout and a groundout put an end to the rally and the game. 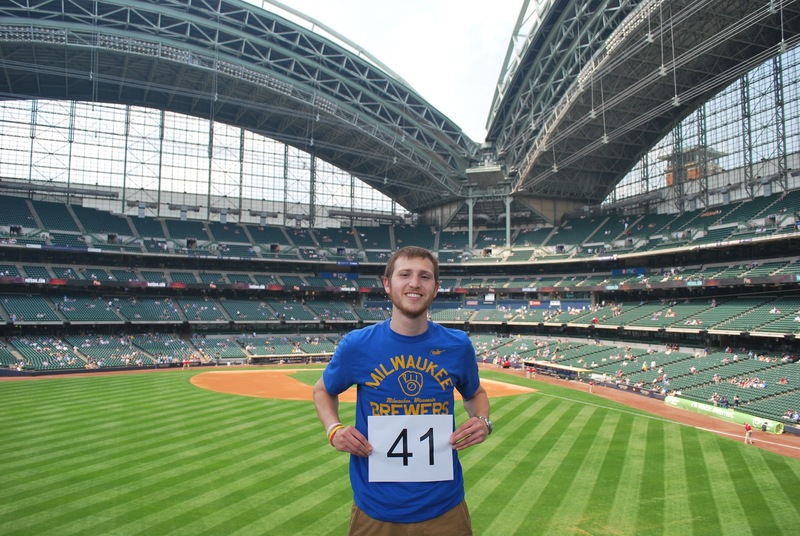 The Brewers’ highpoint of the game was probably in the top of the first inning. After a leadoff double by the Twins, Norichika Aoki made a back-to-home-plate-over-the-shoulder-Willie-Mays-esque catch on a ball hit to straight-away centerfield. Gomez probably would’ve been camped out under it with how well he plays centerfield, but it was an amazing catch and effort by the Brewers’ Japanese import. 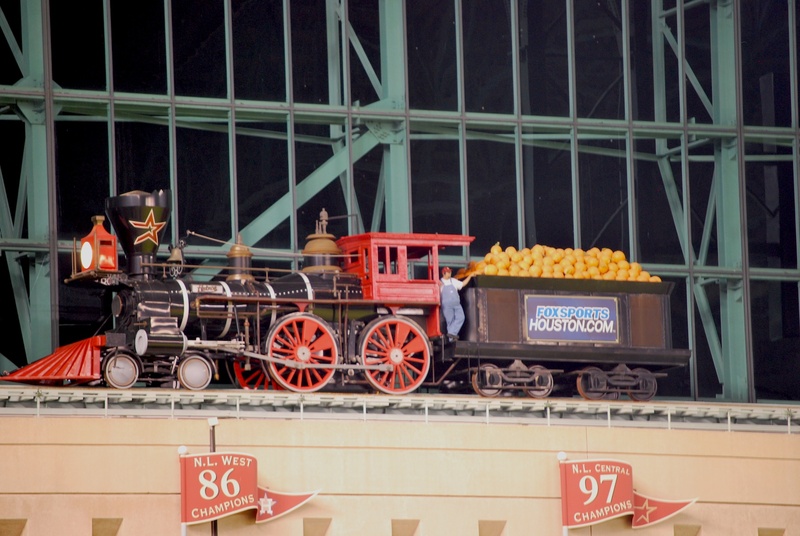 I’m leaving in a little bit to meet Victoria in Johnson Creek, then it’s on to Milwaukee for game two of the series. I’m really hoping it goes better than it did yesterday, because that was tough to watch. Thousands of fans left early, but Erica and I stuck it out until the bitter end. I don’t know what would’ve happened if I wasn’t tracking my pitches seen (and missed), but I still think I would’ve stayed. Even though the product on the field isn’t what I hoped it would be, I’m not going to jump ship. Someone tweeted at me and said after the game I should consider abandoning the mission. I responded that I made my bed, and now I have to sleep in it. Plus, I just received the 2,500 business cards in the mail, so there will be no aborting mission from this guy. For all of you that have donated to Be The Match, I thank you. I received an update from my Be The Match contact, and we’re up to roughly $1,300 raised. It’s hard to track how many people have joined the registry because of my story, but I know at least a few people have joined. It’s only May, which means I’ve still got four plus months to spread the word, and I’m hoping that’s not the only thing I have to look forward to. But if that’s the case I’ll still feel good about my decision to quit my job and raise awareness and funds for something that means a lot to me. Thursday I got up around 9:00 am and I took advantage of Holiday Inn’s breakfast. I had a bowl of Frosted Flakes, a glass of orange juice, a cinnamon roll, an omelet, and a banana. I also took an apple to snack on before I left for the day. 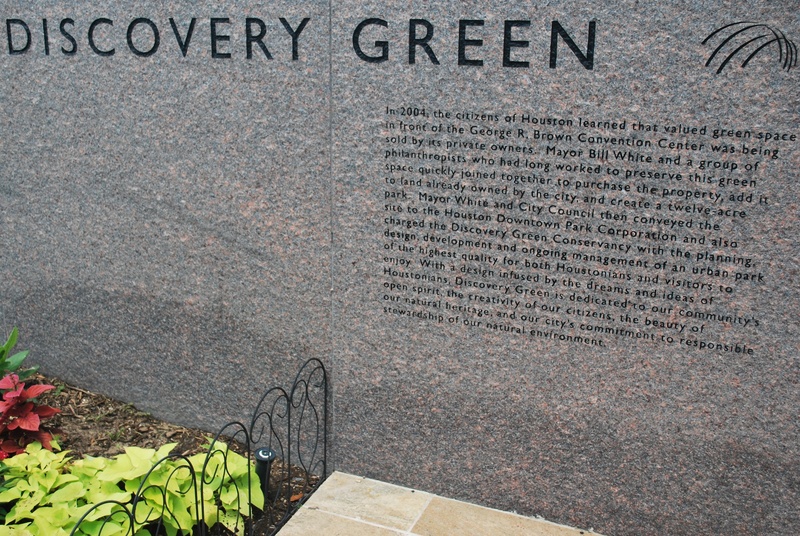 I didn’t really have plans for the day, but I passed Discovery Green the day before, and figured I could spend some time there before the game. I got there around 1:20, and spent a good hour walking around and taking pictures. 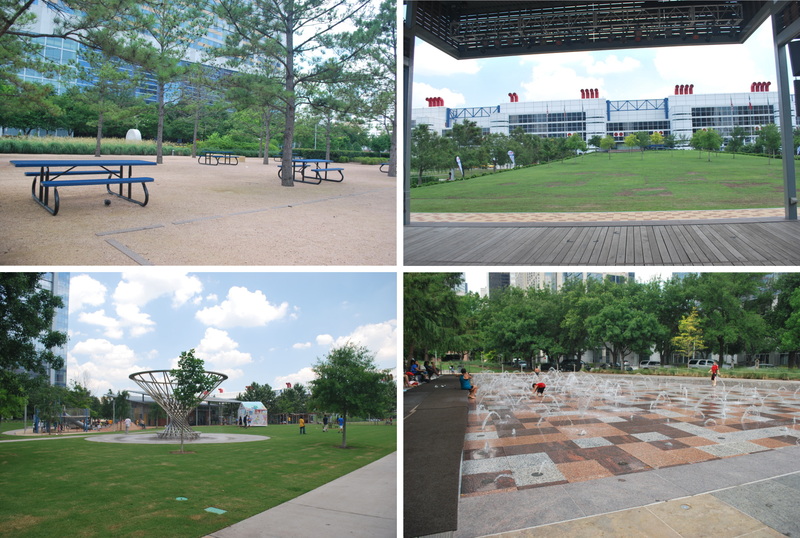 What is Discovery Green? I’ll let this explain it. 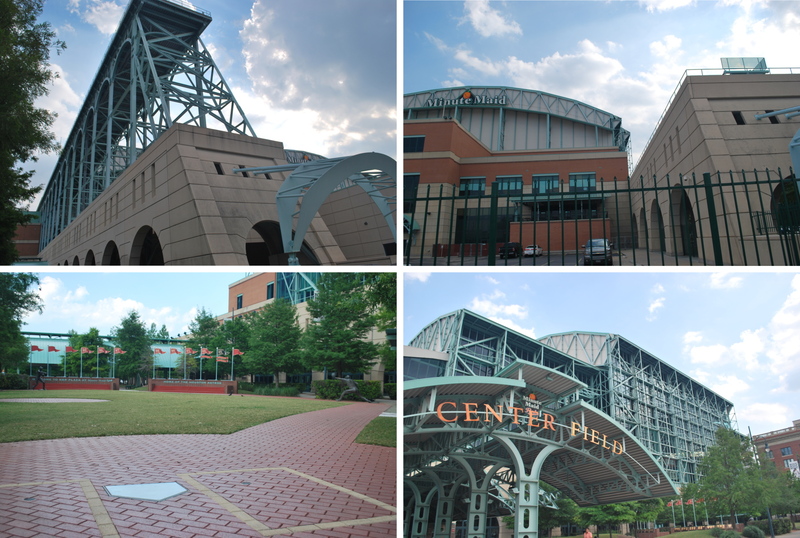 In 2004, the citizens of Houston learned that valued green space in front of the George R. Brown Convention Center was being sold by its private owners. 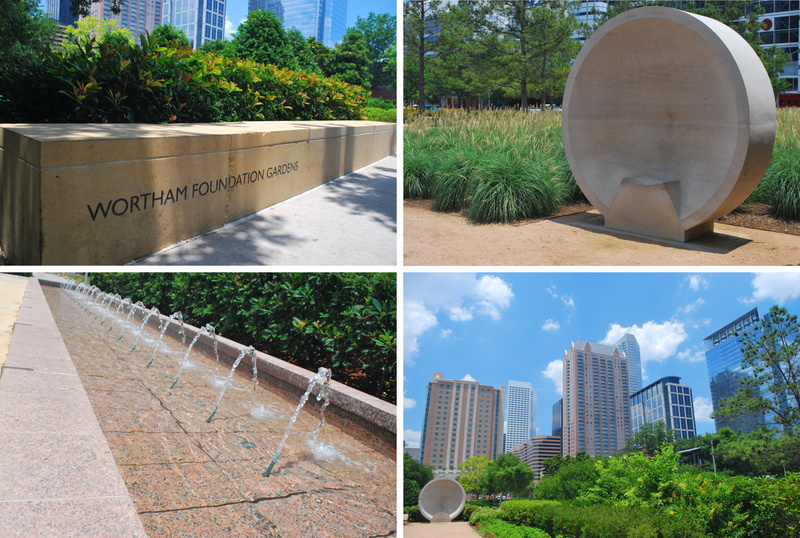 Mayor Bill White and a group of philanthropists who had long worked to preserve this green space quickly joined together to purchase the property, add it to land already owned by the city, and create a twelve-acre park. 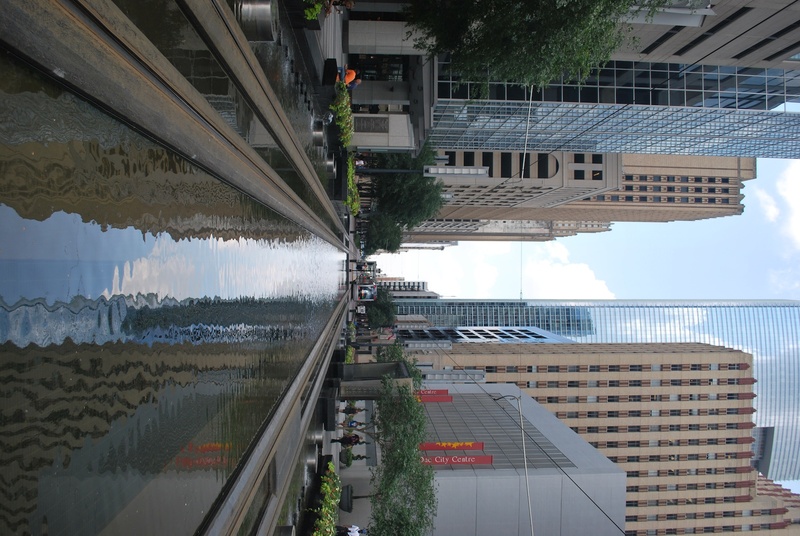 Mayor White and City Council then conveyed the cite to the Houston Downtown Park Corporation and also charged the Discovery Green Conservancy with the planning, design, development and ongoing management of an urban park of the highest quality for both Houstonians and visitors to enjoy. 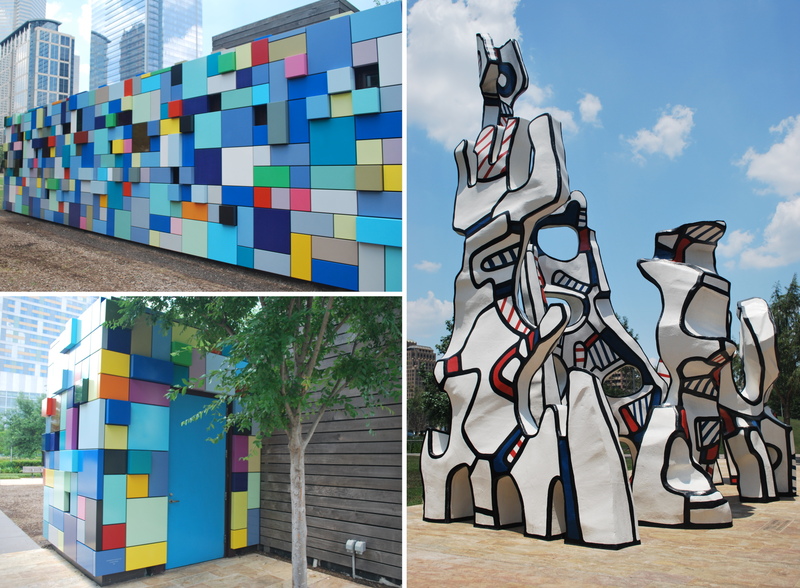 With a design infused by the dreams and ideas of Houstonians, Discovery Green is dedicated to our community’s open spirit, the creativity of our citizens, the beauty of our natural heritage, and our city’s commitment to responsible stewardship of our natural environment. 1) The signage for the garden inside the park. 2) A giant one person circular bench, yes, that’s a seat there in the middle. 3) The view from the seat in photo number two. As you can see there’s another circular seat across from the one I was sitting in. 4) A water feature that’s located past the seat seen in photo number three. 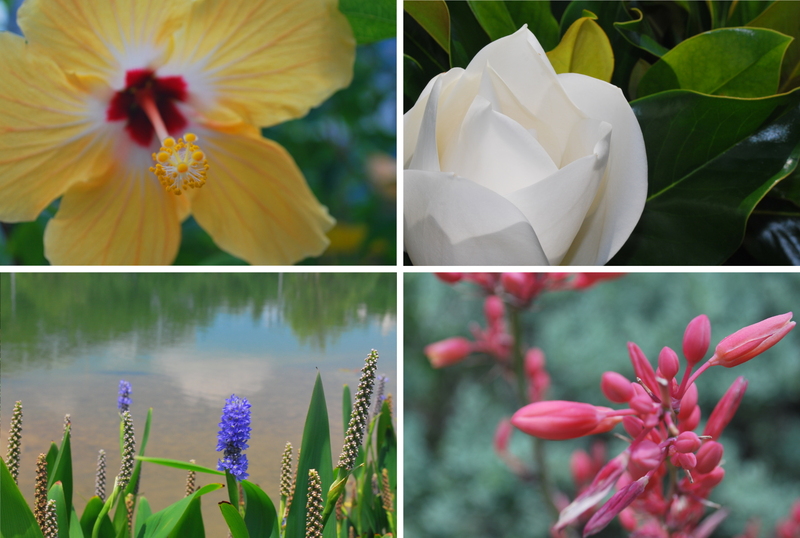 There were lots of plants and flowers within the park, and some are below. They each don’t need a description. So you can look at them in whatever order you please. My personal favorite, and possibly my favorite of the day, is the one in the top left. 1) Picnic tables where park-goers can eat. 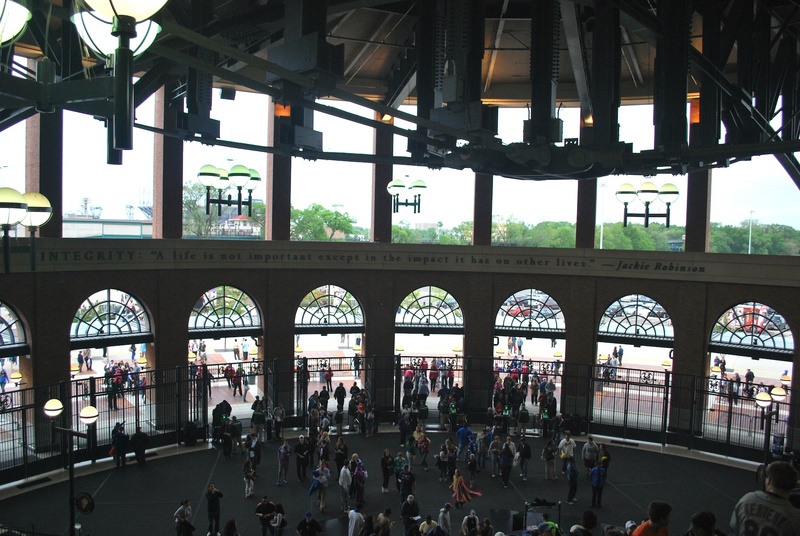 2) This is looking out at the lawn from the Anheuser-Busch Stage, where concerts take place. 3) Kids can play in the water streams, they shoot skyward at various times. 4) The structure in the middle has water coming down from the ring at the top. I considered taking my clothes off and running around underneath it because it was hot and I was sweating, but I didn’t. I think a night in jail might lower my pitches seen percentage too much, so I didn’t want to risk it. There’s also a jungle gym on the left for kids. There was also some art pieces. The upper left picture is of a structure that I just thought was a piece of artwork, but as you can see from the lower left picture, it has a door. If you look closely at the top left picture you can see some tiny windows, so I’m not quite sure what it’s used for, but I’m intrigued. 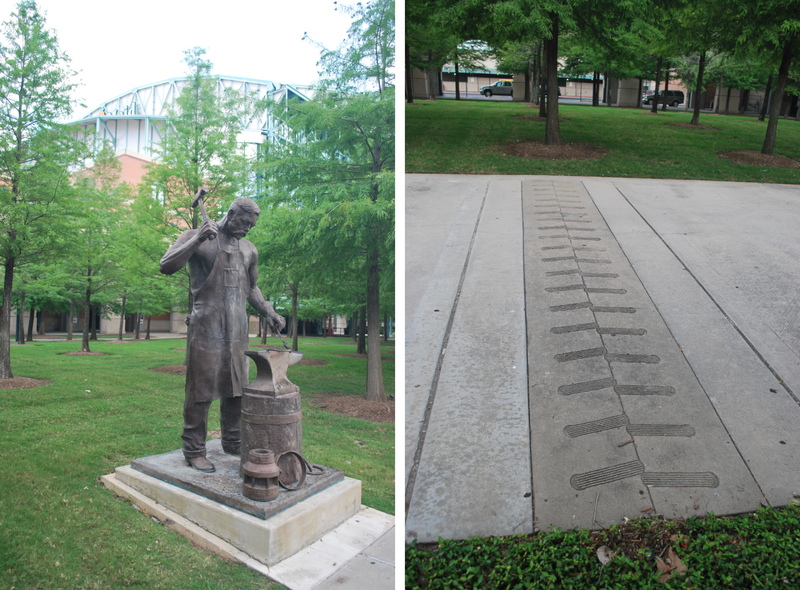 The picture on the right is a piece that’s on display along the Avenida de las Americas, the street that runs right in front of the George R. Brown Convention Center. 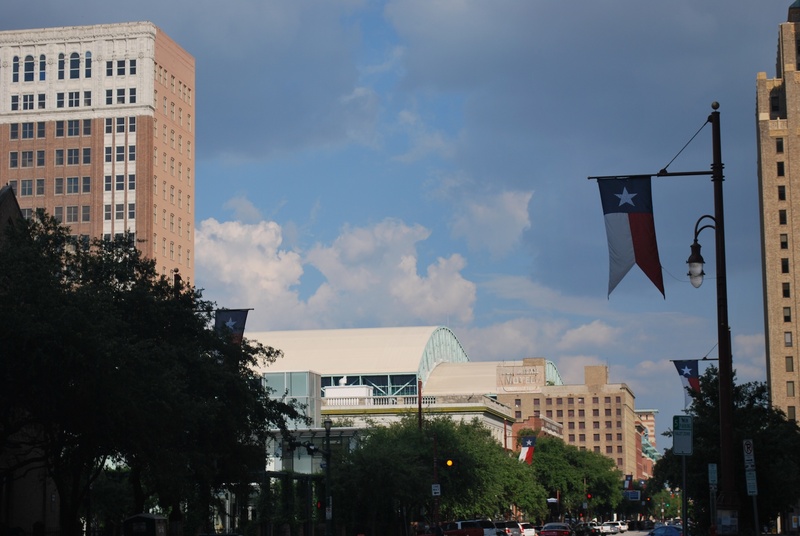 After I was done at Discovery Green, I walked downtown and got a sub at Jimmy John’s for lunch. I don’t know what it was, but it just didn’t taste right. They may have not been using the freshest ingredients, but the sub left something to be desired. Jimmy John’s is on main street, and the metro rial system runs right down the middle of said street. There’s even a part where the track runs over some water, as seen below. It seems like a very quiet and comfortable ride. You can see one of the trains in the distance on the track on the right. 1) The support for the roof track down the first base side. 2) The back of the stadium, and on the right is the roof support and track for the left field side. When the roof is open the supports and windows that are visible in picture #3 would be right up close to the end of that track in photo #2. The 1st base side track is much higher, because there aren’t windows that move like they do on the left field side. 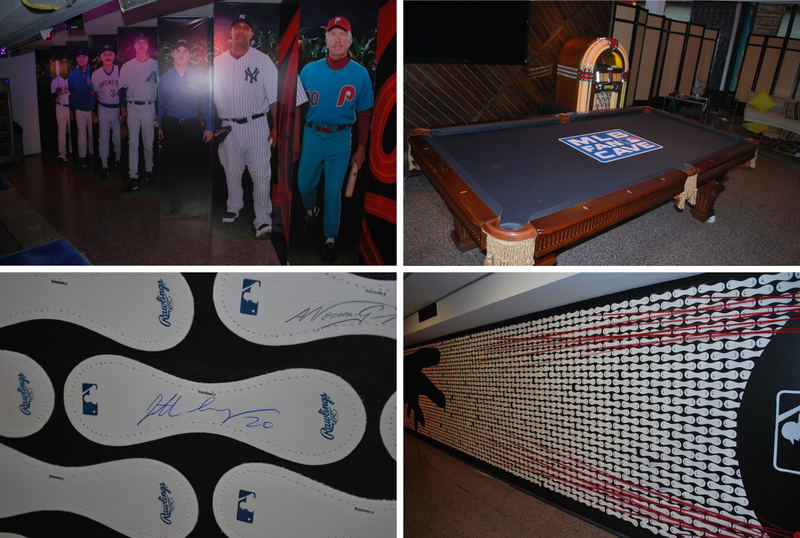 3) The centerfield entrance. On the right you can see all the windows that I was talking about. 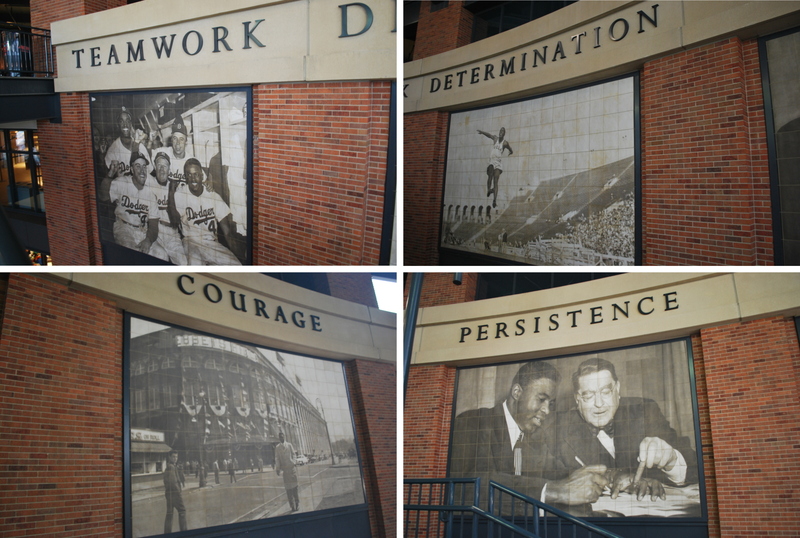 If you read yesterday’s post you can see that these panels are right behind the train track in left field. 4) KBR plaza. You can see an infielder turning a double play at second base, and a first basemen awaiting the throw. 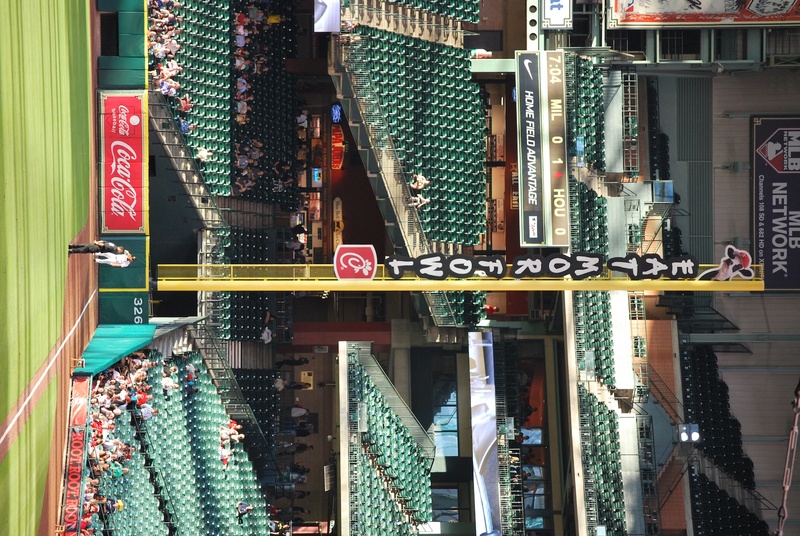 To make it even more accurate they should have a ball magically suspended in the air somewhere between the two bases. There were two last things that I thought were interesting. On the left you have a statue of somebody, but I’m not sure who. There’s no plaque, and the only visible text is “Stewart E. Stevenson” on the anvil. 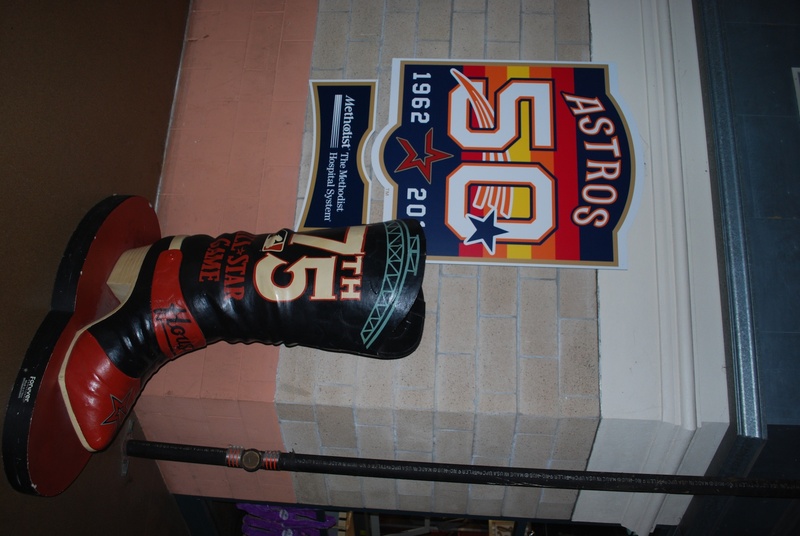 A google search with that name and “Astros” doesn’t bring up anything that connects the two, so it’s a mystery right now (for me anyways). On the right is baseball stitching that separates segments of sidewalk. 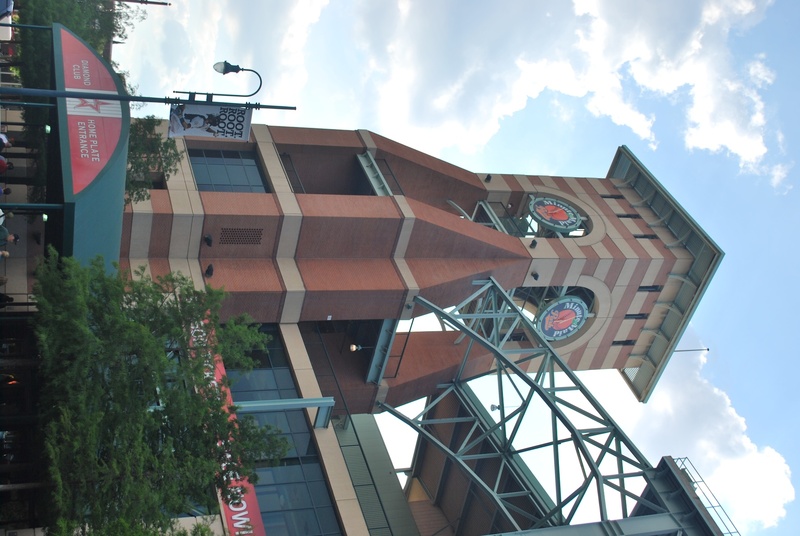 They have this going all around the exterior of the ballpark, and I didn’t make the observation until my second day at the stadium. The ones that I had seen up to this point weren’t as obvious as the one below, so I’ll cut myself a little bit of slack, but not much. I went back to the will call window, got my ticket, and got inside just before six. 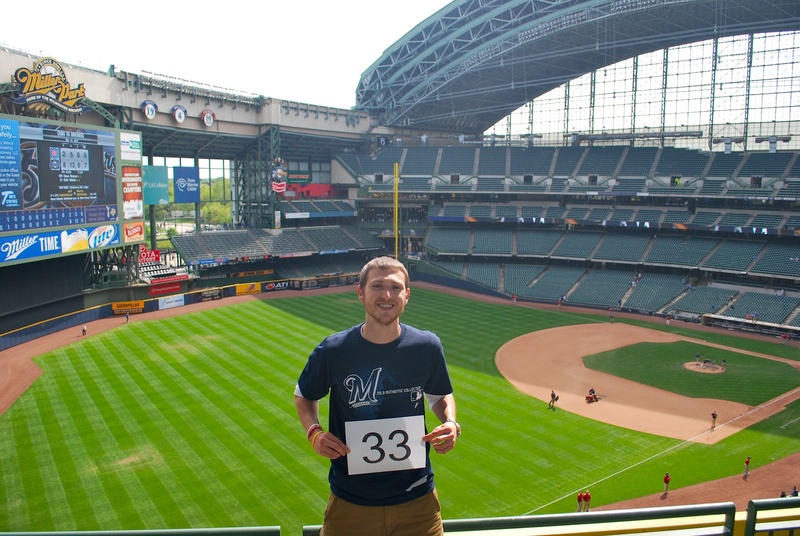 I walked around on the field level until the Brewers finished taking batting practice, then headed to the upper deck to get game photo number 38 taken. I had an usher take the picture, and she was very patient with me, and she made some adjustments to get a picture I was satisfied with. 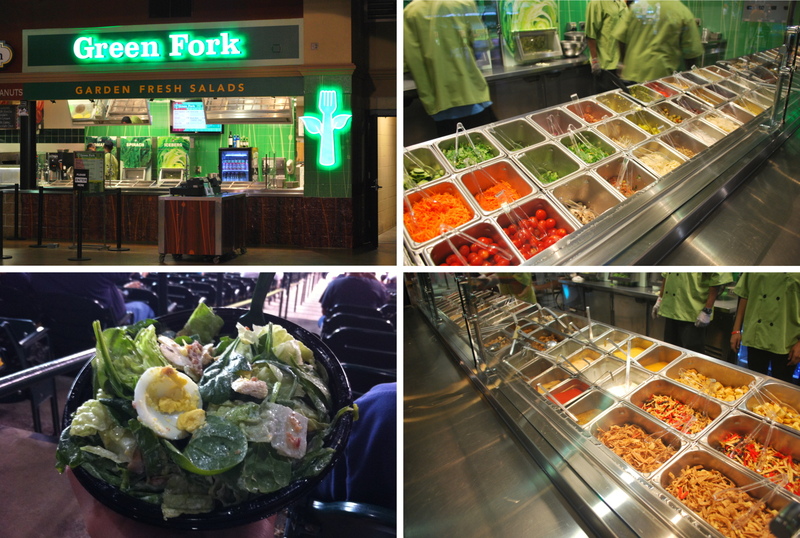 1) The Green Fork concession stand from a distance, if you look closely you can see that the choice of greens are Romaine, Spinach, and Iceburg. 2) The vegetable choices, and there were a lot. 3) The protein choices, which cost an additional $4. 4) My $12 salad. I had a mixture of romaine and spinach, and I added mushrooms, bacon, egg, green pepper, cucumber, almonds, grilled chicken, and light ranch. To be honest, I wasn’t impressed, I really think it was because of the chicken, I’m not sure if they use leftovers from the day before, but it certainly seemed that way. There wasn’t too much to cheer about during the game, for both teams really. 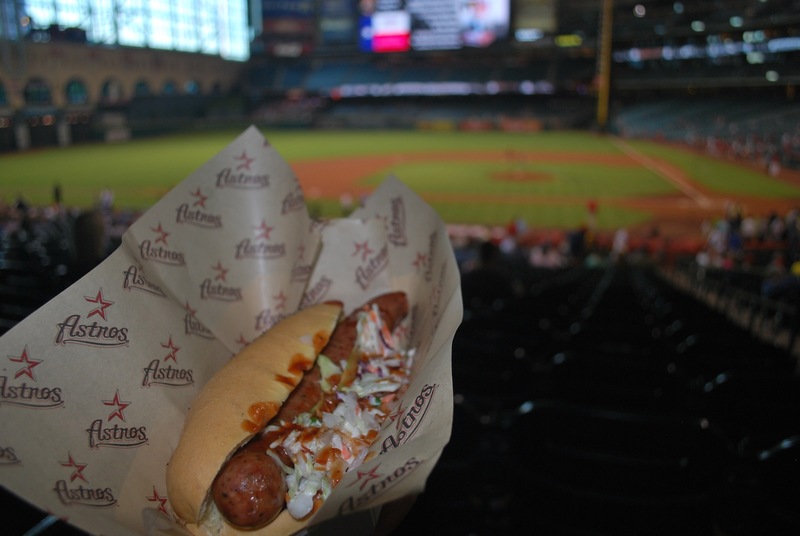 The Astros scored four runs in the fourth inning, and that was it. 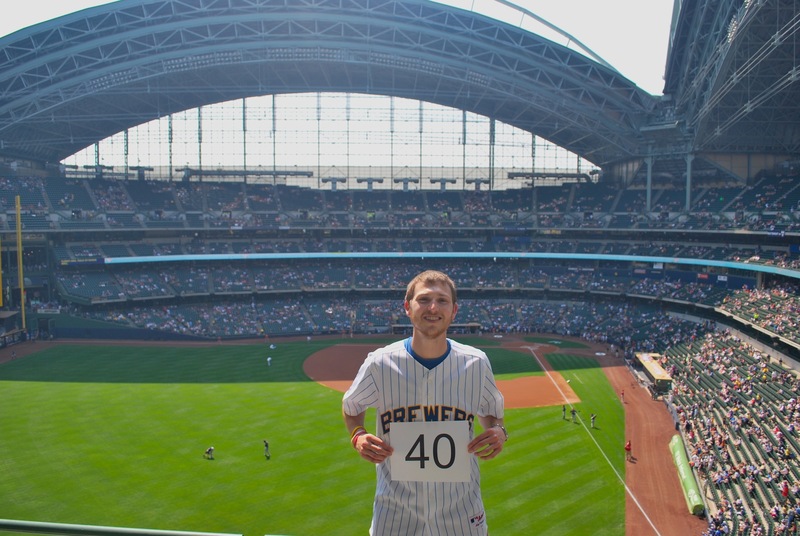 The Brewers had a lot of opportunities to get off the schneid, but they failed to do so. They had the bases loaded in the third inning with only one out and Braun coming up. Braun popped out in foul territory on the first pitch and Ramirez grounded out weakly to third. In the fifth the Brewers had runners on second and third with two outs and Braun at the plate, but a groundout on the second pitch put on end to the scoring chance. It was that kind of night, not a blowout by any means, but still disheartening. 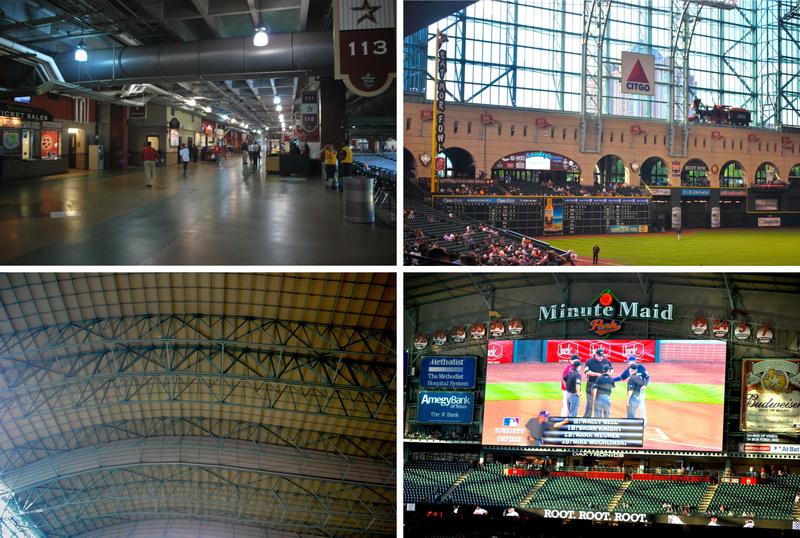 Final Score: Astros 4 – Brewers 0. A 1-3 record on a two city road trip doesn’t feel the greatest, but things can’t continue to go this bad (or at least that’s what I’ll keep telling myself). My flight leaves at 11:00 am from Houston on Friday, and I have a layover in St. Louis. I’m supposed to arrive in Milwaukee at 4:30 pm. I could’ve scheduled an earlier arrival, and I’ll be kicking myself if this itinerary backfires. 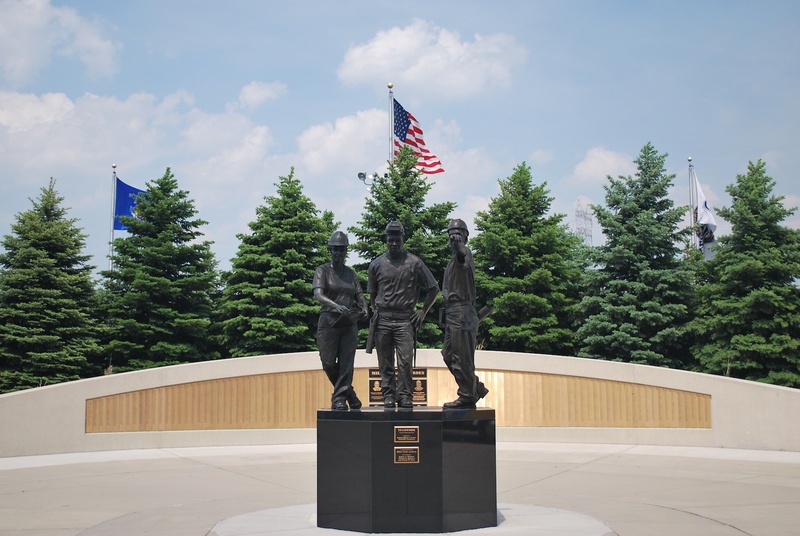 If all goes as planned I should be to Miller Park no later than 6:00 pm for the first game with the Twins. Monday started with a 3:00 am alarm, and my friend David and I were on the road by four. We pulled into the $6 parking at General Mitchell at 5:00 am, and were in the airport by 5:07. We got through security a lot faster than I expected and we were the first people waiting at the gate by 5:30. We boarded the plane at 7:03 and were in the air by 7:30. We touched down at 10:17 eastern time and were in a cab shortly thereafter. It was my first experience with a New York City cabbie, and I can see why they get a bad reputation. He was weaving in and out of traffic, staying in exit lanes while we were in really slow traffic so he could cut 15 or so cars, and so on. We made it safely to Luke’s apartment by 11:15. Luke is a friend of David’s, and he’s also a Fort Atkinson grad, but before my time, I graduated in ’05, he in ’98. He lives in Brooklyn and works for Sports Illustrated, primarily SI.com. He’ll be going to London later this summer to cover the Olympics, and he’s a really cool guy. 1) Part of the menu. 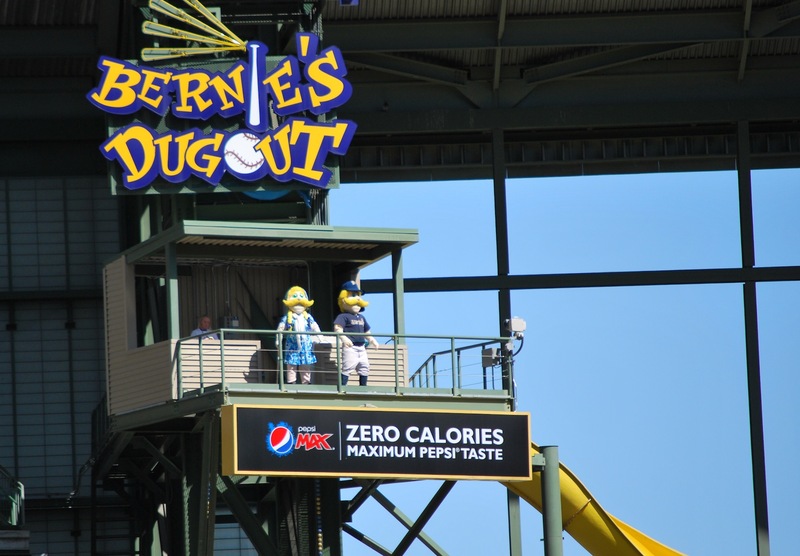 The Brewers had started a “Where’s Chorizo?” campaign on Mother’s Day, and I tweeted at Bernie Brewer and informed him that I found the missing sausage. 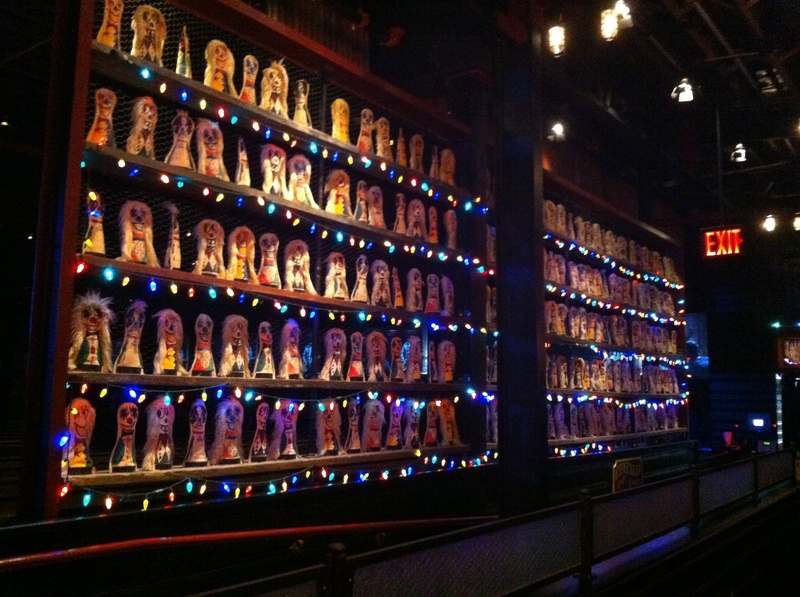 2) The cool lights they had hanging above the bar. 3) David’s beer on the left (Sixpoint’s Tiger IPA), and my beer on the left (Sixpoint’s Seasonal offering; “Diesel”). 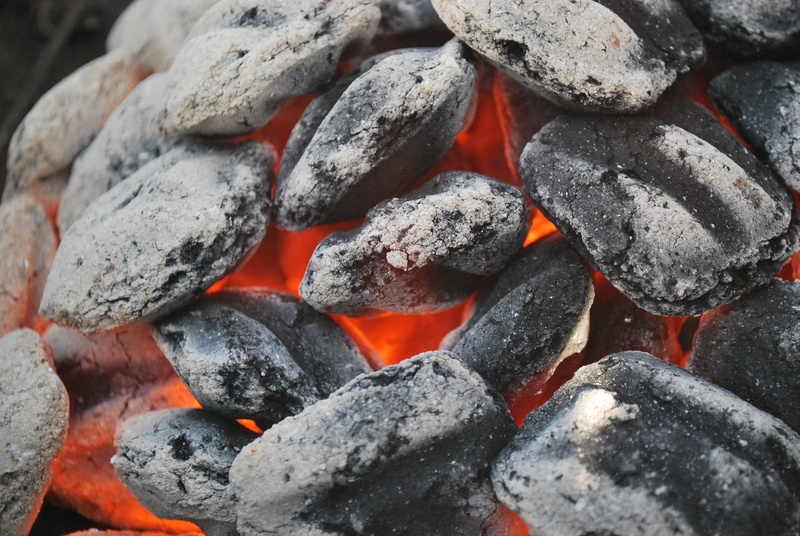 As you can see, Diesel was a fitting name for it, as it was quite heavy, but very flavorful. 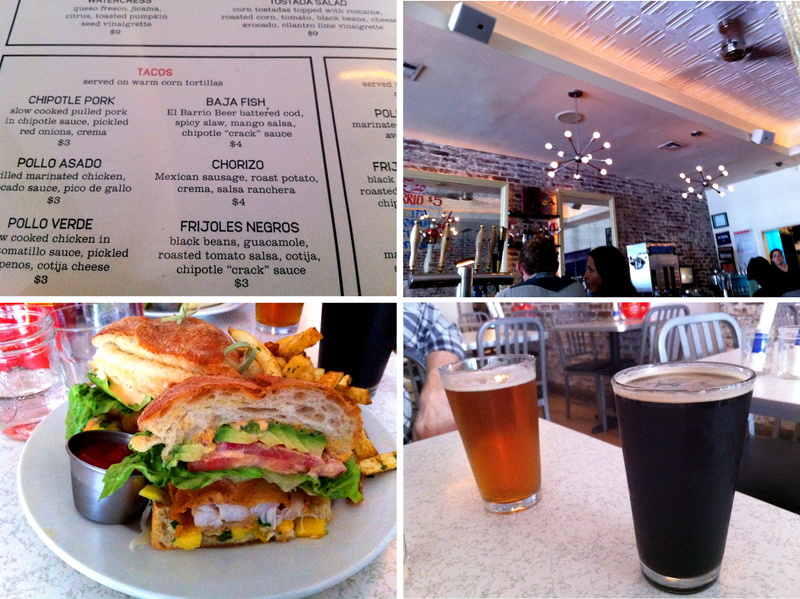 4) My lunch; a Baja Fish (fried cod) Torta, which is a mexican style sandwich on grilled ciabatta bread with avocado, tomato, black bean spread, spicy slaw, and chipotle “crack” sauce. It also came with chile-cilantro fries. For $12, I’d say it was worth it. After lunch David and I returned to Luke’s as he was finishing up an article for SI.com. 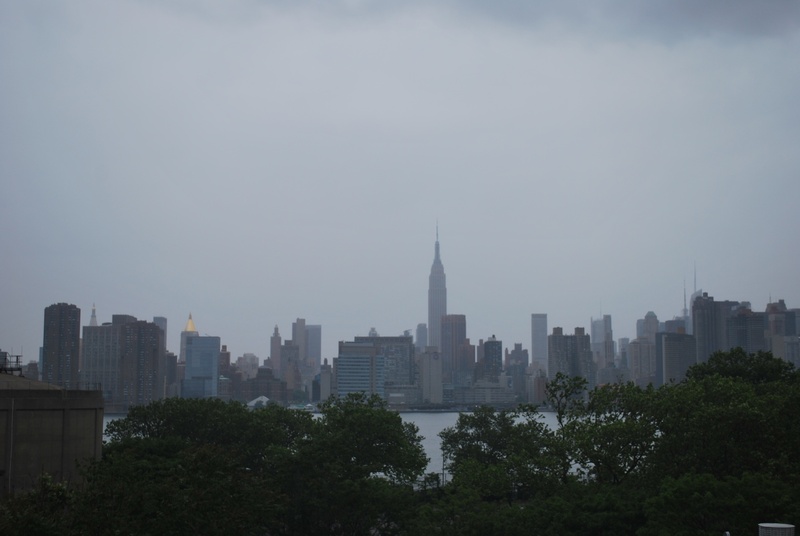 We went to the roof of his building, and it provides a great view of the Manhattan skyline. This is looking west at downtown Manhattan, the tallest building in the middle is the Empire State Building. You can also see the Freedom Tower (“One World Trade Center” legally) from the roof. It is under construction and should open in the summer or fall of 2013. 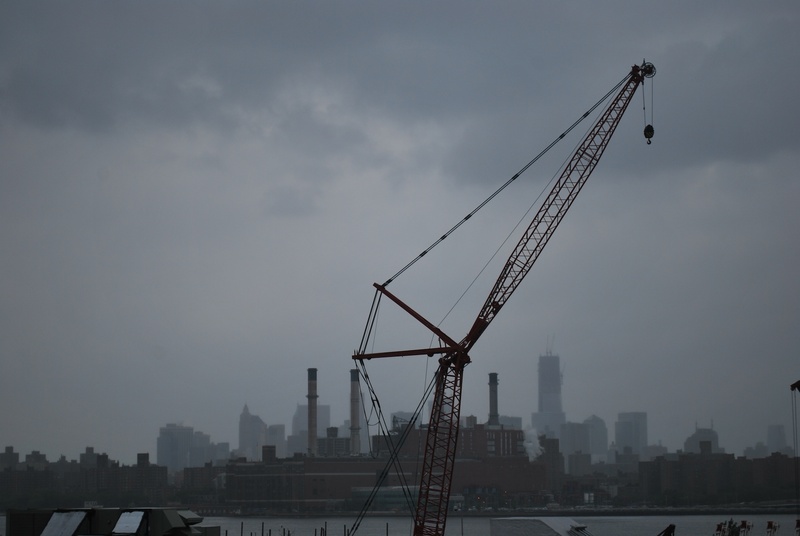 The Freedom Tower is the tallest building in the distance, just to the right of the third smokestack (from the left). We all took a nap (separately), and bummed around until it was time to go to the game. 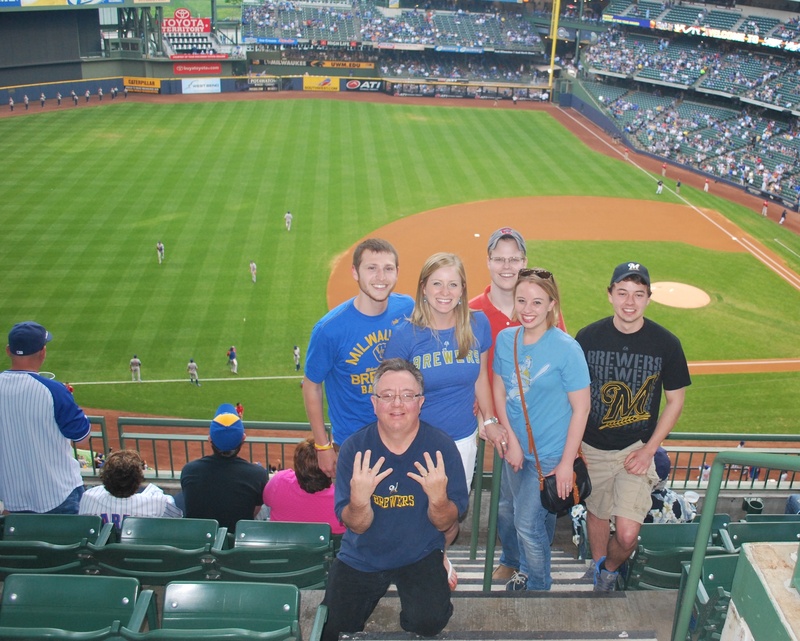 Another Fort Atkinson grad, Jessy, who is going to grad school in Albany, came down for the series as well. We all left for the subway at 5:45, and after transferring to the 7 train we arrived at the Mets/Willits Point stop at 6:25. From the elevated stop you can see Citi Field, and after getting to the bottom of the staircase, it was about 150 feet to get to the best spot for game photo number 35. 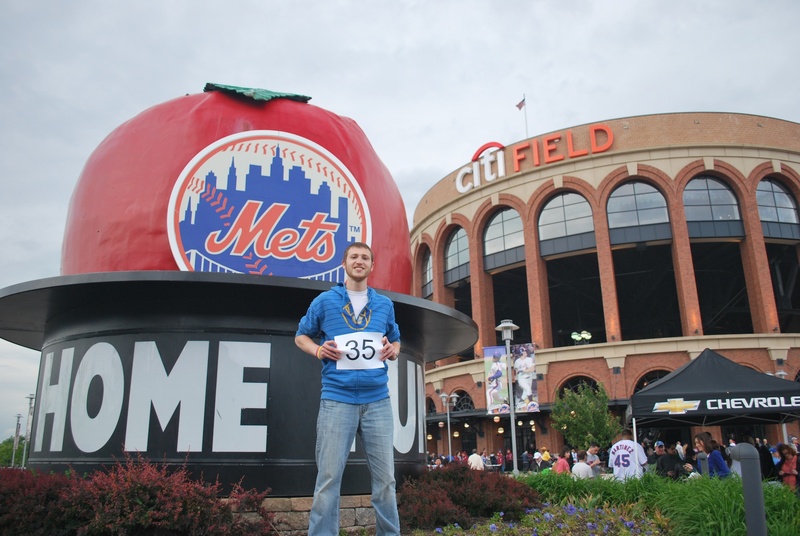 The Mets had this Home Run Apple at Shea Stadium (their old ballpark) and now have it on display outside of Citi Field. I went to the player will call window and got my game ticket, which was in section 121. It just so happened that Luke, Jessy, and two of their friends also had seats in 121. There was some confusion and David thought that I was going to be getting two tickets, but he was able to get a ticket and sit with the other guys. I sat in my seat which was 13 rows behind them, but eventually moved down and caught the last few innings with them. 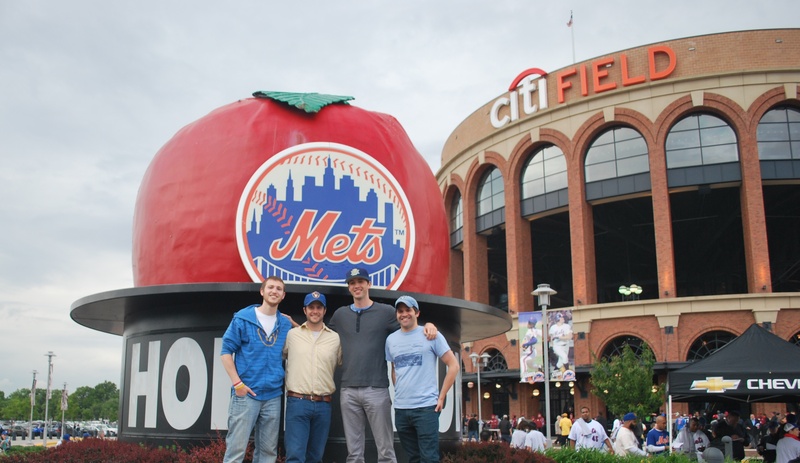 We had also gotten a picture with the four of us in front of the Home Run Apple. From left to right it’s myself, Jessy, Luke, and David. We went inside, and I took a bunch of pictures. 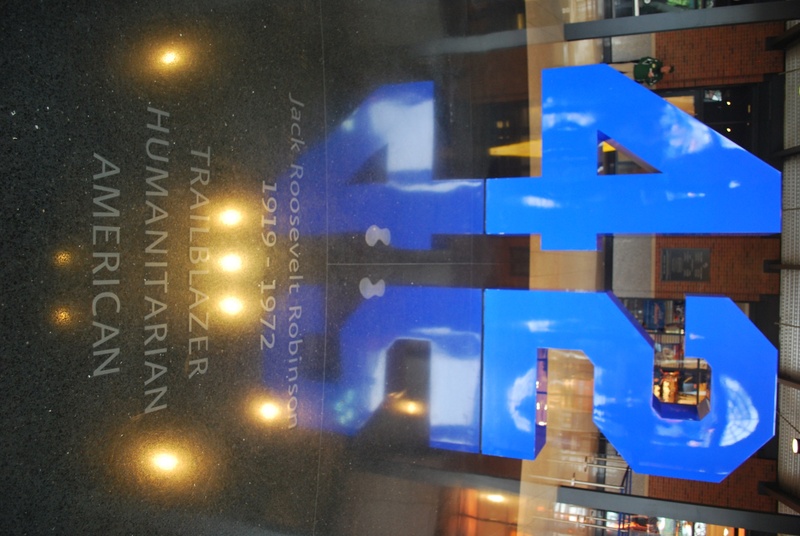 The home plate entrance is called the Jackie Robinson Rotunda, and it’s pretty sweet. They pay homage to the man who broke the color barrier, and they do so (justifiably) in grand fashion. When you walk in you’re greeted with escalators right in front of you, and staircases going up both sides of the rotunda. Behind the middle escalators there’s a giant number 42, with Jackie’s full name and some defining words in front of it. Going up both staircases they have pictures and more defining characteristics above them. No need for descriptions on these. From the top of the escalators, and looking back down and out of the rotunda provides a nice view. 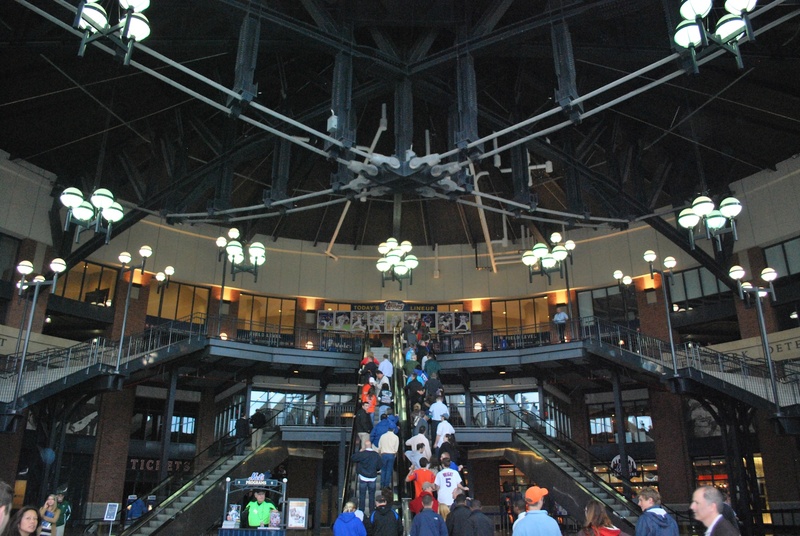 The rotunda was made to somewhat resemble Ebbets Field, and they did a good job. On the way to my seat I made a pit stop at a concession stand, and picked up a Nathan’s Famous Hot Dog. It was $6, but I’ll say it was at least close to being worth it. 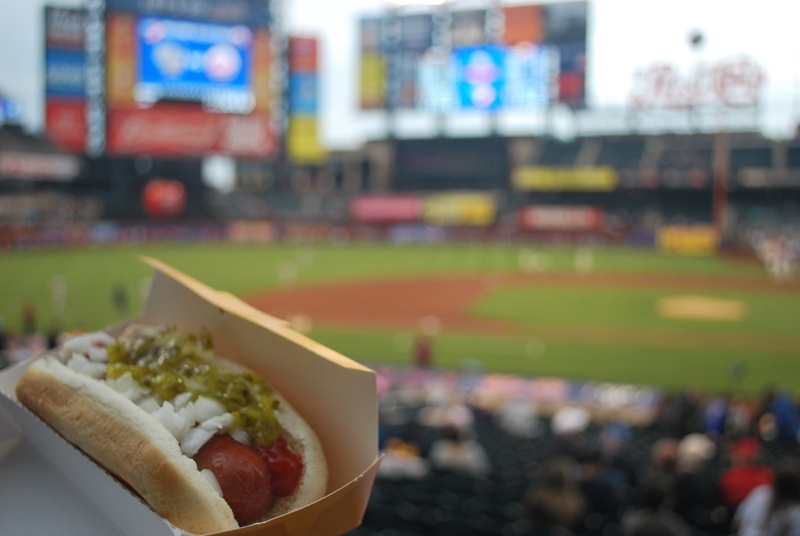 I got to my seat, and quickly devoured the dog before the national anthem. Before doing so I got the hot dog with the field in the background. They had ketchup, mustard, onions, relish, and jalapeños as condiment offerings. I put on everything but the jalapeños. I like jalapeños, but just wasn’t in the mood for a spicy dog. 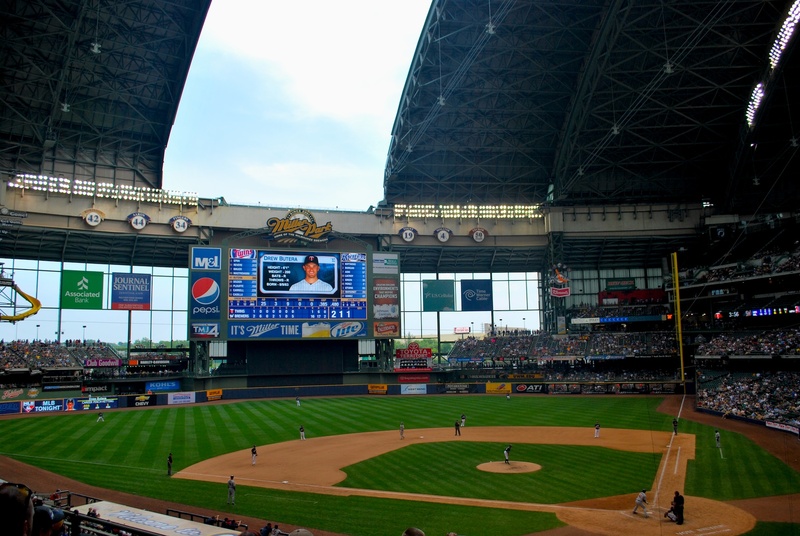 The game got underway, and the Brewers quickly had a runner in scoring position. After Nyjer grounded out Lucroy singled, and advanced to second on Braun’s groundout. 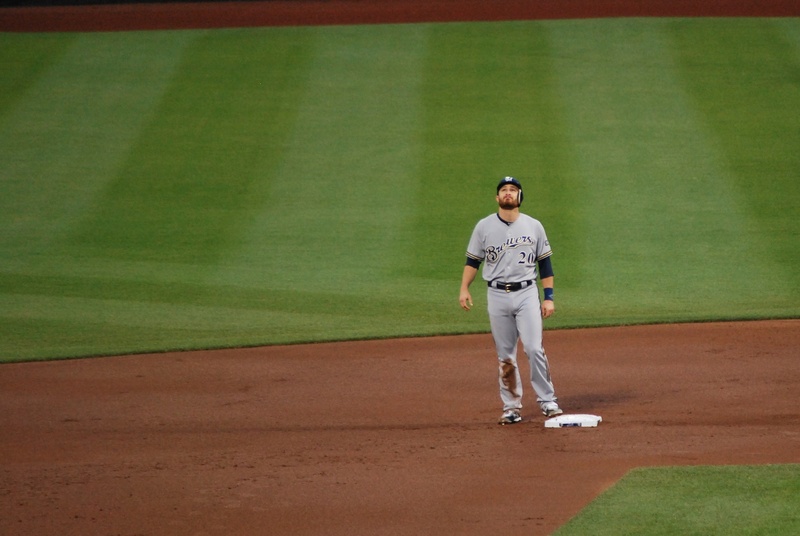 I had my camera and was zoomed in on Lucroy at second base when I felt a raindrop hit my forehead. 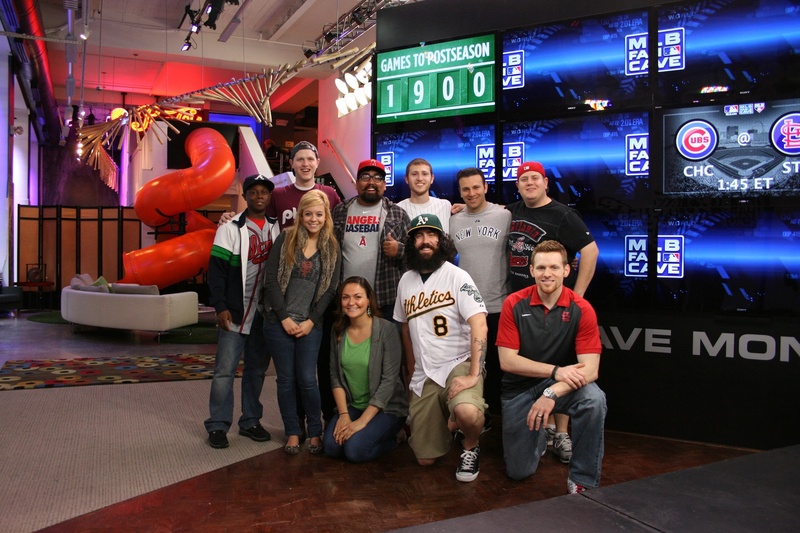 Lucroy must’ve had the same thing happen as I was about to take the picture, because Lucroy began looking skyward. The Brewers failed to score in the first, but the Mets didn’t, singling home a run in the bottom half. The game stayed 1-0 until the sixth, when the Mets added another run on a suicide squeeze. They added another in the eighth to make it 3-0, when Conrad (the Brewers second basemen), came home on a groundout. The runner on third stopped halfway, and got into a pickle, only to see Ramirez fumble away the ball, and the run scored easily. The Brewers made it interesting in the ninth, pushing across one run, and they had guys on first and second with only one out. Conrad struck out looking, and Georgie flew out to right, and the Brewers lost for the second straight day. Final Score: Mets 3 – Brewers 1. The Mets didn’t hit a home run during the game, but they show the Home Run Apple in action during the seventh inning stretch. 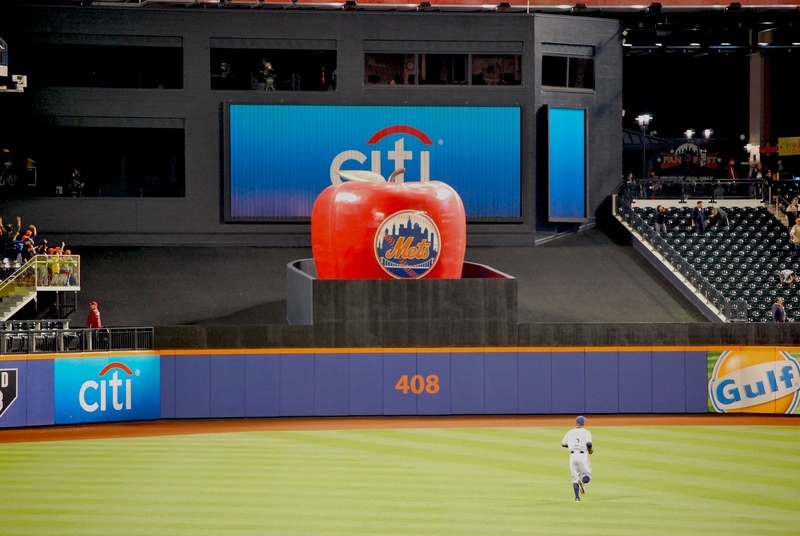 It’s certainly iconic, and the fans are happy that they brought the tradition over from Shea Stadium, albeit with a new apple. We jumped back on the 7 train after the game, and went back to Brooklyn. Before heading back to Luke’s place, we all agreed that stopping for some pizza and beer was in order. Luke and David had told me about a bar (Lulu’s) where if you buy a pint of beer you get a free pizza. I thought they were messing with me but it’s no joke. If you want toppings (other than cheese), you have to pay $1 per selection, but it’s worth it. 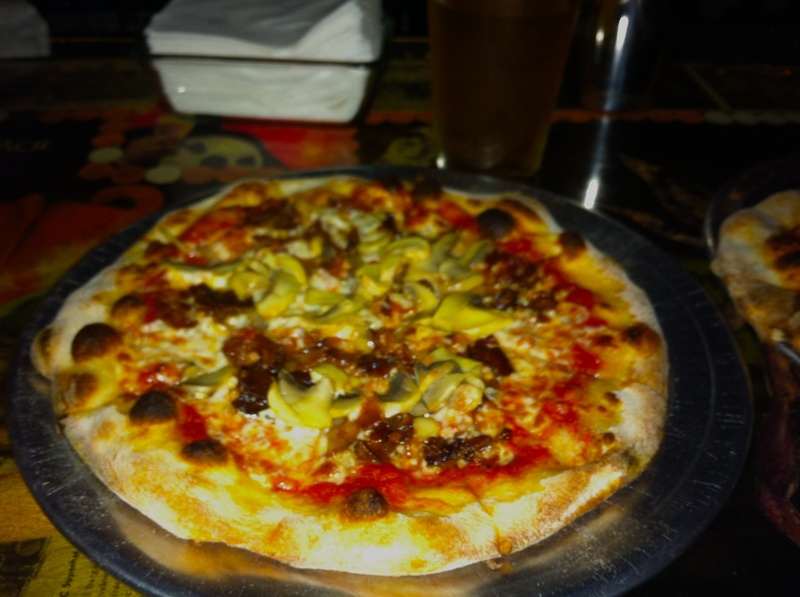 I had a wheat beer and then paid an extra $2 to get mushrooms and bacon on my pizza. The result was a pizza that I demolished in about five minutes. We went back to Luke’s at around midnight, and returned to the rooftop because it was still nice out. I had nowhere to set my camera to get a (really) good night shot, but this will do. 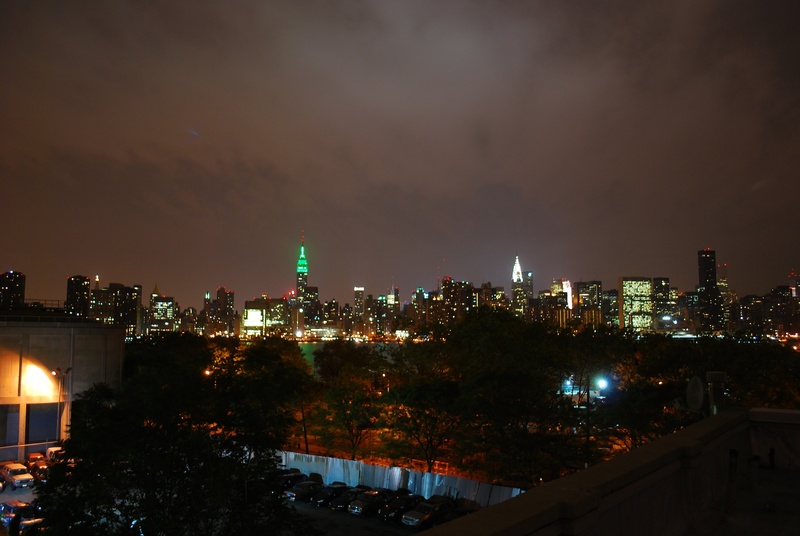 The green building is once again the Empire State Building. 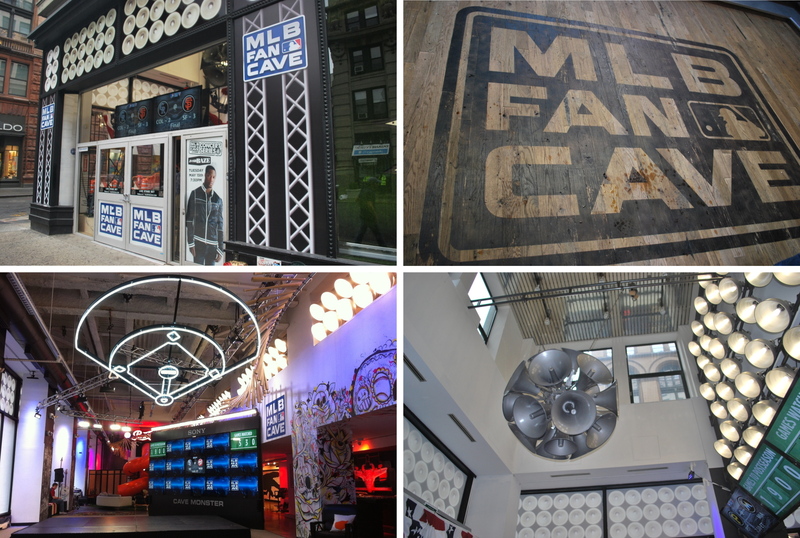 It’s 3:00 am, and I’ll be up in about six hours to go to the MLB fan cave, so that’s all for now. 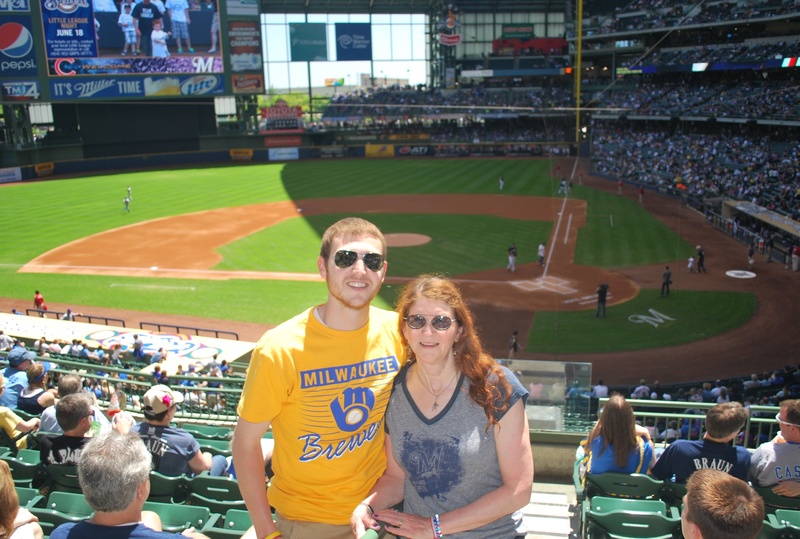 Today is Mother’s Day, and I spent it with my mom (Sue) at Miller Park. When I got home I went and found a picture of us when I was just a little guy. 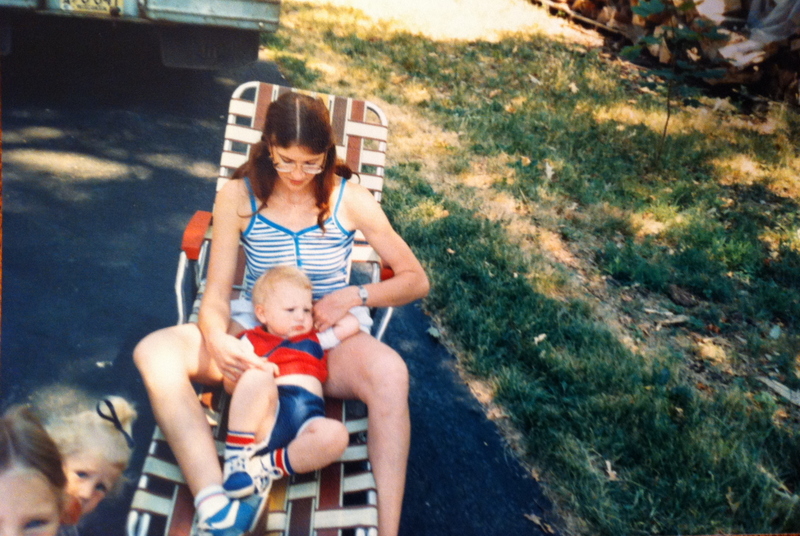 The picture was dated July 4th, 1988. I noticed that my two sisters wanted to be in the picture as well, and you can see their heads in the lower left hand corner. We left for the game at 11:00, and made a pit stop at Jimmy John’s to get a sub for the game. This idea later backfired as I was eating my sub in the first inning. One of the Cubs fouled a pitch back my way and I wasn’t prepared. It was across the aisle, but there wasn’t anyone in the row where the ball landed, it would’ve been an easy catch. I had told someone that I expected to catch one by the 20th home game. Today was the 18th, and I still haven’t caught one, there have been a bunch of close calls, but no luck. 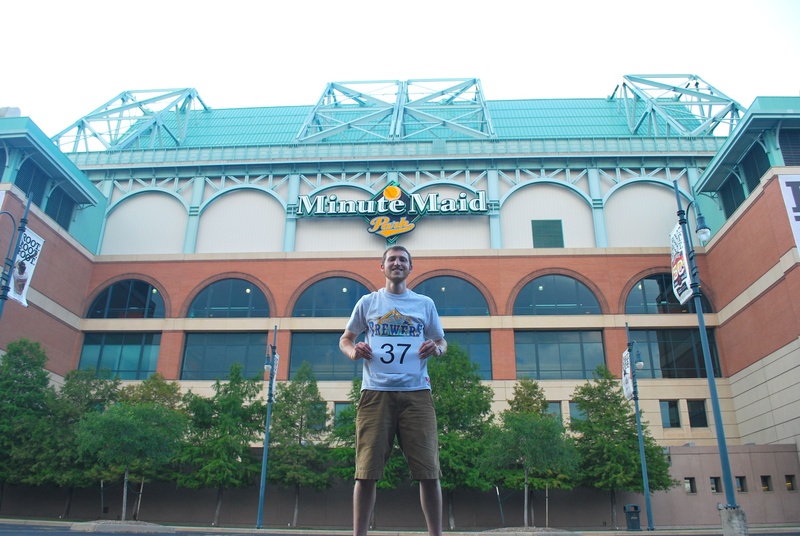 We got to the Cooooooooooooper parking lot at 12:30, and decided to try and get the game number picture taken before the game. 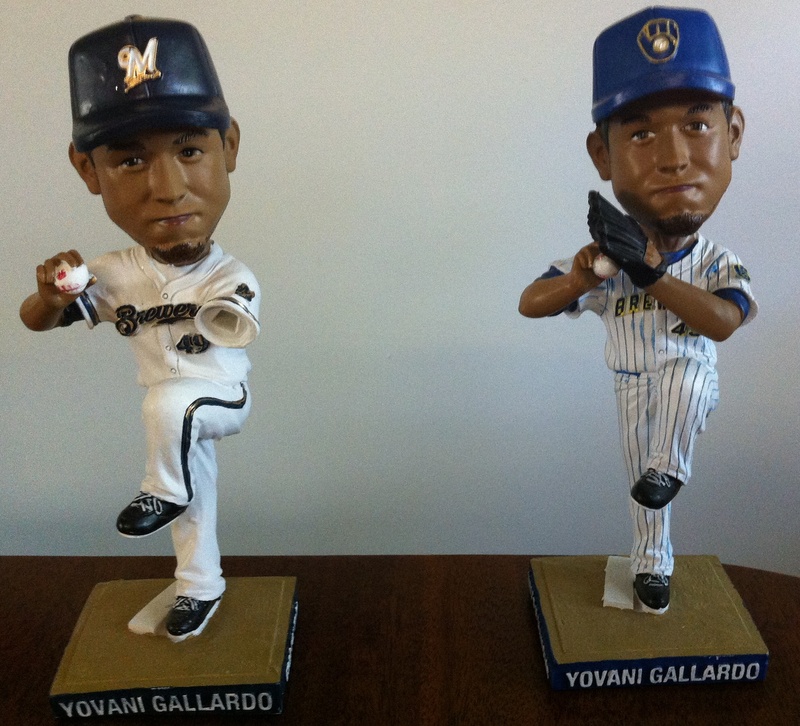 The line to get into Miller Park was quite long, because it was somewhat close to first pitch, and it was a sellout for the Yovani Gallardo bobblehead. We opened the boxes and saw that one of them was the retro version (NICE! ), but didn’t take them all the way out to inspect. When we got home I took them out, and to my surprise one of them displayed Gallardo in a post-dismemberment fashion. I should’ve checked them right away, and then asked for a replacement, but we were in a hurry. I’m hoping I can exchange it during the next home-stand, but there’s no guarantee that they’ll believe me. I’m a (somewhat) honest person, but there are probably people who accidentally break it, and then come back and claim it was like that when they got it. This was such a clean “break”, that if it came with the arm loose in the box I would’ve probably just glued it back on myself. 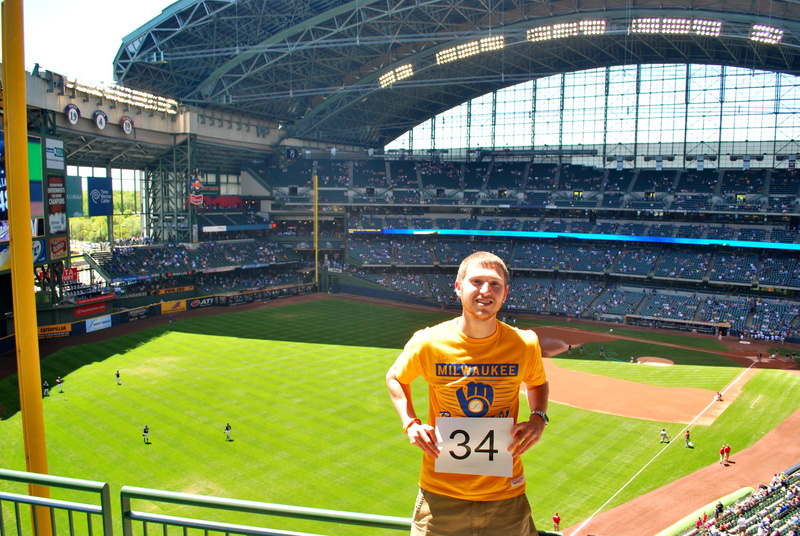 Once inside, we headed for section 438, after today I’ll only need two more game number pictures from the upper deck. After that it’s down to the loge level. As you can see in the picture above, the two panels that would normally be tucked above the stationary one are partially extended. They do this to eliminate the roof-line-shadow from splitting the mound and the batter’s box. 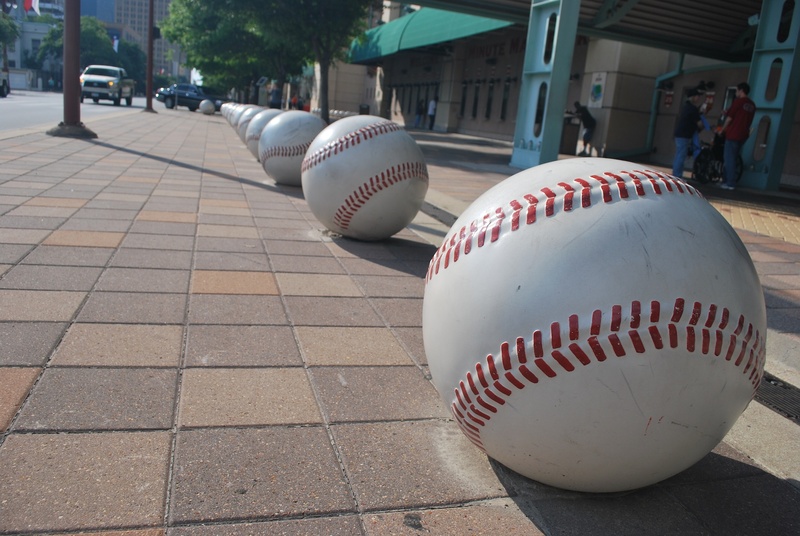 It makes it more difficult for the batters, because the pitch will come from the sunlight, and at the halfway point enter the shadows, making it tough to pick-up. They didn’t always do this, and Ben Sheets (a former Brewers pitcher), may have benefited from it during his 18 strikeout performance in May of 2004. The roof-line-shadow would only split the mound and batters box for part of the game, but I guess they want to keep it consistent for the entire game. After getting the picture taken we went down to our seats, after stopping to say “YOOOOOOO!! !” to the ice man. He hangs out selling beer above section 215 before most games, so if you want to see who I keep referring to, go say hi. At some point I’ll get my picture taken with him, but I keep forgetting. When we made it to our seats I had a nearby fan take a picture of my mom and I. I’ve gotten a little bit bigger than the first picture of this entry. Bernie Brewer and his mom were up in Bernie’s dugout throughout the game, and I got a picture of them shortly after they finished dancing to Roll Out the Barrel. Bernie’s mom had a cane and was hobbling around up there. I think the cane was just part of the act, but I can’t say for sure. On Mother’s Day the MLB temporarily allows the use of pink bats to help raise awareness for breast cancer and the Susan G. Komen for the Cure organization. 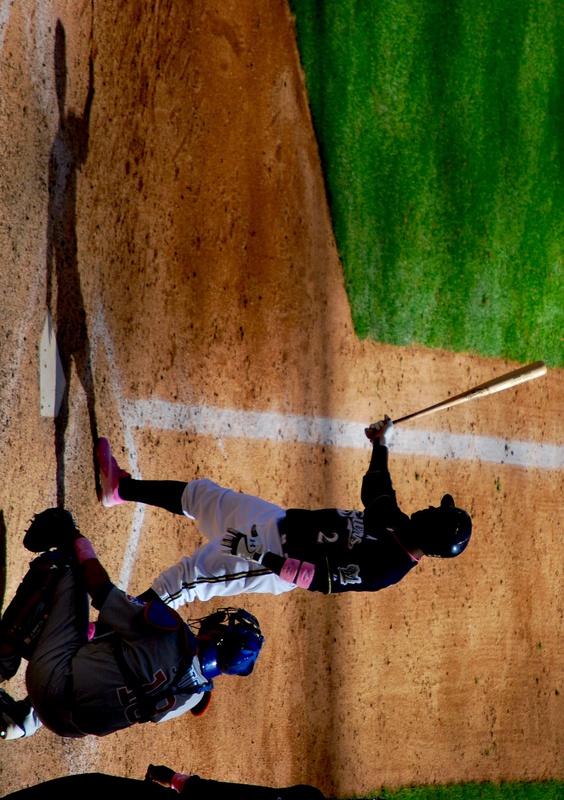 For some reason, none of the Brewers decided to use a pink bat. 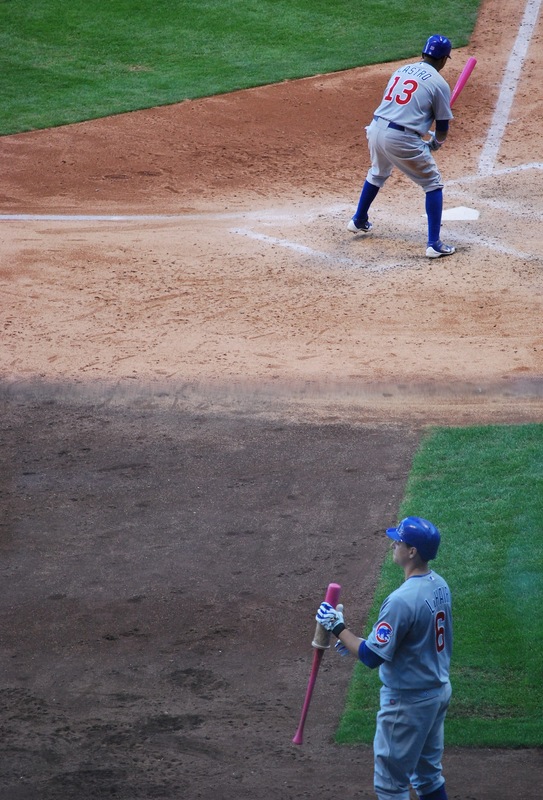 Some of the Cubs did, and the picture below shows Starlin Castro at the plate using one and Bryan LaHair in the on deck circle with one as well. 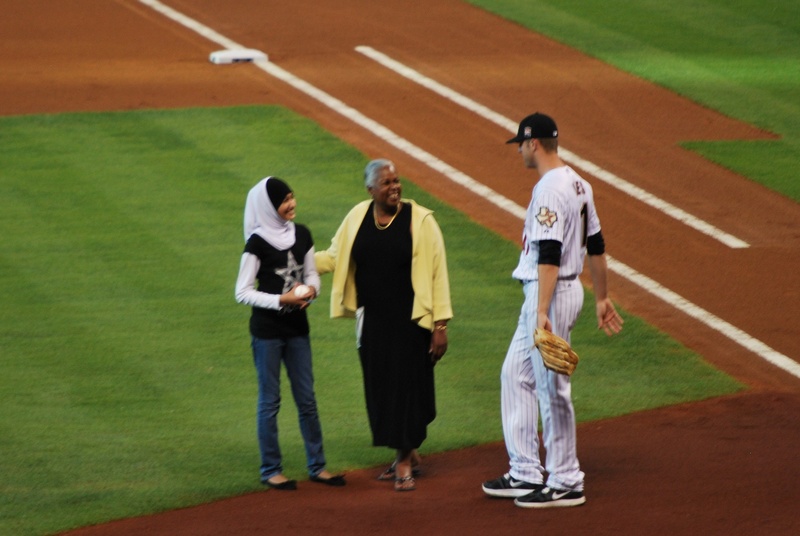 Bill Hall, a former Brewer, hit a walk-off home run using a pink bat on Mother’s Day back in 2006, with his mother in the stands. The bat went to auction and Mark Attanosia (the Brewers owner) won the bat with a $25,000 bid, and gave the bat to Hall’s mother. The home run provided a great moment, and Attanasio made it last with the very kind gesture. Nyjer Morgan, who didn’t get the start, was sporting pink arm bands and some pink cleats. He did wind up making an appearance in the ninth inning as a pinch hitter. The game itself was close early, but the Cubs blew it open in the later innings. It was tied at two a piece going into the top of the seventh inning, but the Cubs scored 1, 2, and 3 runs in the 7th, 8th, and 9th innings, respectively. Final Score: Cubs 8 – Brewers 2. I would elaborate further, but there really wasn’t much excitement. The first Brewers run scored on a sacrifice fly, and the second on an infield single by Taylor Green, who had both RBIs for the Crew. After getting back to town, we decided to hit up Frostie Freeze, Fort Atkinson’s answer to any soft serve ice cream establishment on planet earth. I may be a little biased, but not much. 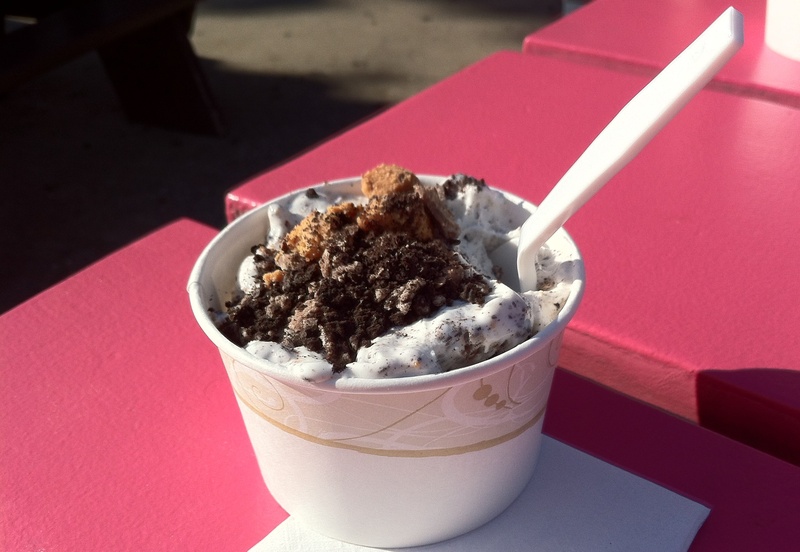 It opened in 1983 and has been providing Fort Atkinson with ice cream and other cold treats for almost three decades now. 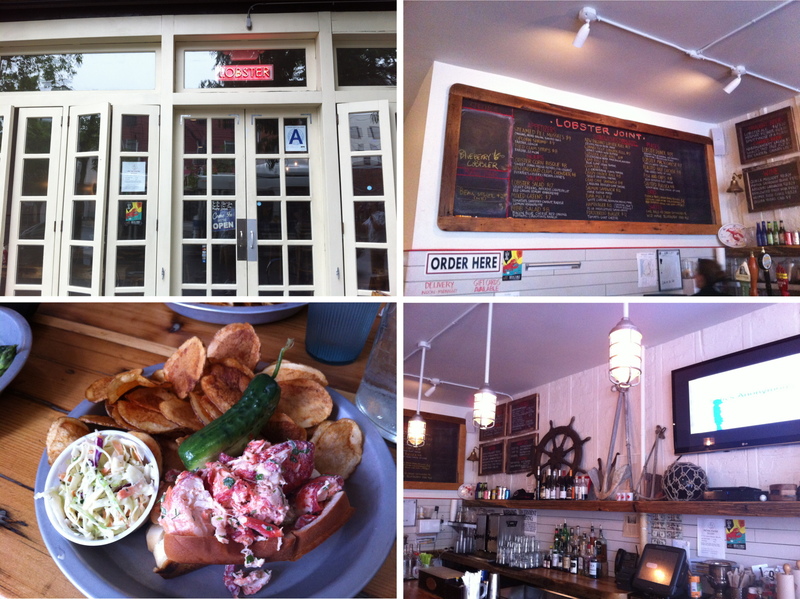 It’s open during the Spring and Summer months, and if you’re ever in town I suggest you make a visit. 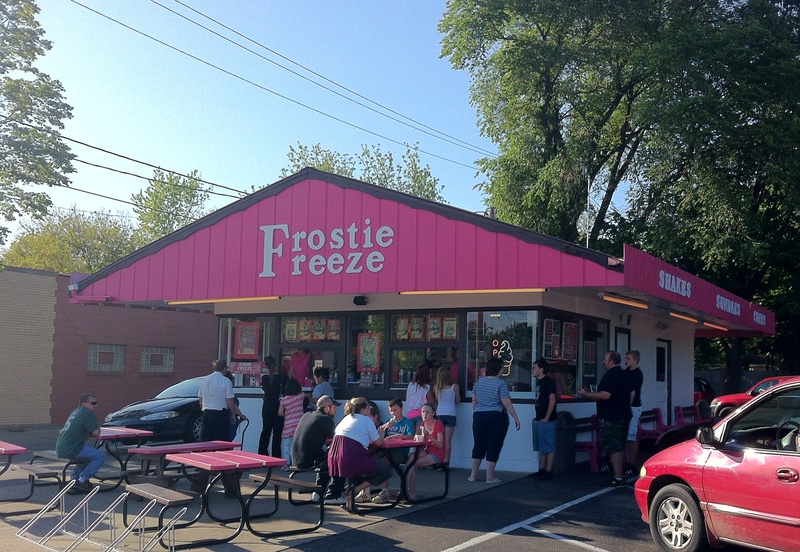 The first picture is of the exterior of Frostie Freeze, which is located on Madison Avenue, just across the street from Vos Sentry Foods. The second picture is what I ordered; an Oreo-peanut butter cup Candy Freeze. At $2.50 it’s a steal. My flight from Milwaukee to New York (LaGuardia), leaves at 7:14 am tomorrow morning, and I’m leaving the house at 3:45 am. I just checked the weather, and the forecast for Monday and Tuesday is looking grim. Monday calls for “showers” (50% chance of rain), and Tuesday calls for “rain” (70%). I’m hoping that it somehow misses us, but it’s not looking too good. 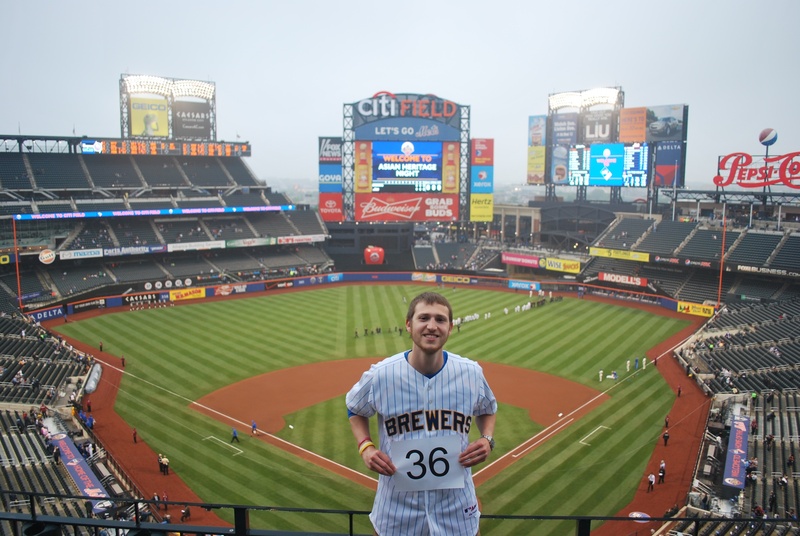 I don’t know when games could be made up, and the Brewers are only making the one scheduled visit to NYC this year. 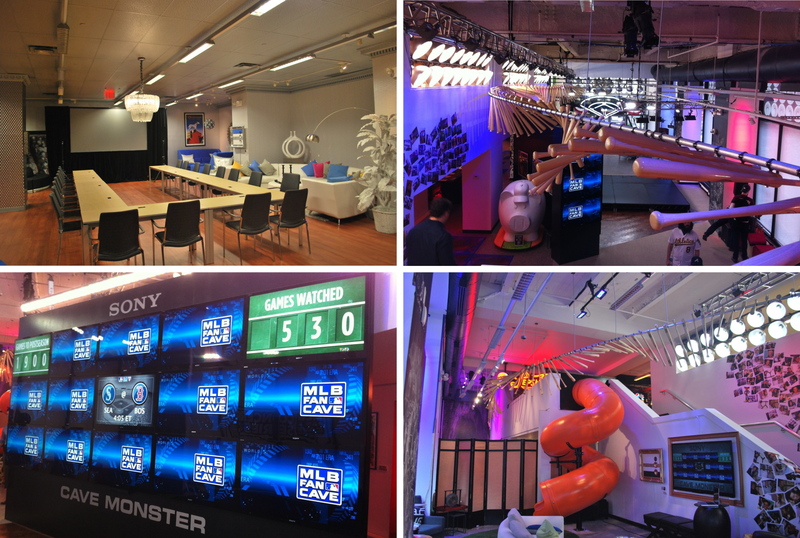 A one game (or two game) makeup date is possible, but unlikely. If both teams are way back in the standings towards the end of the season, they could just not play the games. It’s happened before, and the season could end for both teams with only 160 or 161 games played. I know it’s really early, but I always imagine the worst case scenario and then am pleasantly surprised when things don’t go nearly as bad as I thought they might. The next time you hear from me it should be after a COMPLETED game against the Mets, late Monday night. I didn’t get done writing the post for Friday’s game until 3:00 am, and I finally got to bed just before 3:40. My alarm was set for 9:20, and I was really tempted to just turn it off and go back to sleep. I resisted, and I left the house just before 10:00. I was meeting three friends at Crandall’s place in town, but when I got there one of the three wasn’t there. I texted him three times and called his cell phone seven times in a span of 15 minutes, I also tried his landline three times. At 10:30 we decided to leave without him. When we were five minutes away he texted saying his phone had died so he didn’t have an alarm. I wasn’t too upset but had been looking forward to going to the game with him. We didn’t have time to turn around or any of that nonsense, and any other delays would’ve made it extremely close. 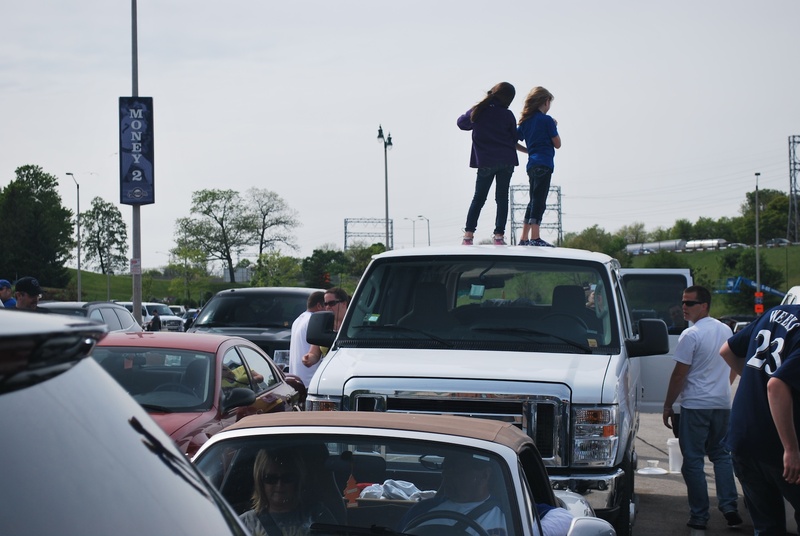 We pulled into the back of the Money lot at 11:45 and made our way towards Miller Park. 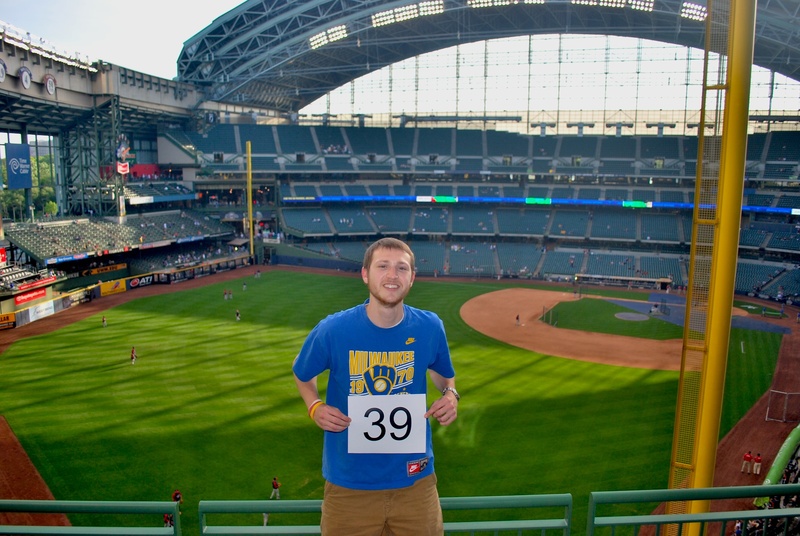 There was no time to get the game number picture taken in the upper deck before the game. I told Crandall and Brietzke (the other attendee), that we’d have to get it done after the game, which they were fine with. I was in my seat with six minutes to spare. That was cutting it a little too close for comfort. Crandall and Brietzke had seats in section 228, and it was just me in my usual 221. After I learned that Tyler (the guy who slept in), was not going to make it, I posted a tweet asking if any of my tweeps wanted to join me for the game, but I think it was a little late. 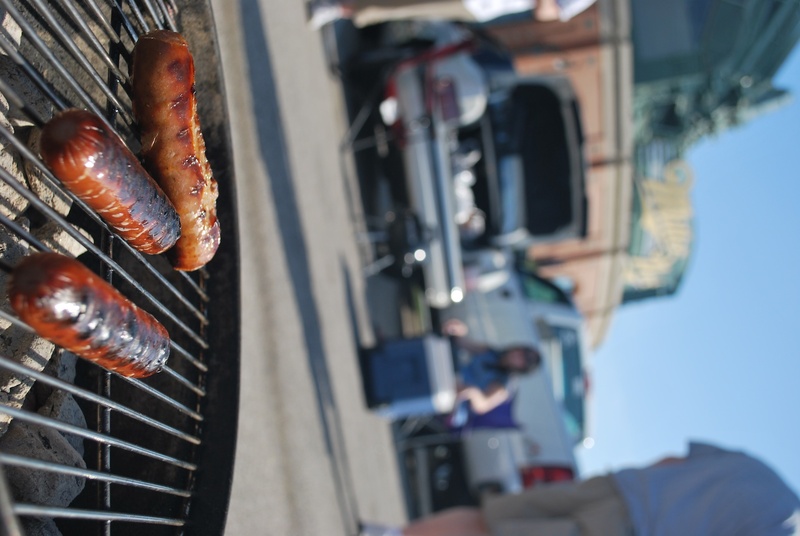 The game got underway and the Crew got down early. A double play groundout by the Cubs’ Castro gave them a 1-0 lead in the first. The Brewers came right back with a run of their own in the bottom of the frame. Nyjer Morgan doubled and Braun was hit by a pitch, and it turned into a first and third situation with two outs. Braun was on first and started running for second, the Cubs’ pitcher Volstad stepped off the mound after the old fake-to-third-go-to-first-move. Volstad ran at Braun and a pickle ensued, Nyjer Morgan started inching towards home, and then took off and scored the tying run without a throw. Braun was tagged out, but Morgan crossed the plate first, so the run counted. 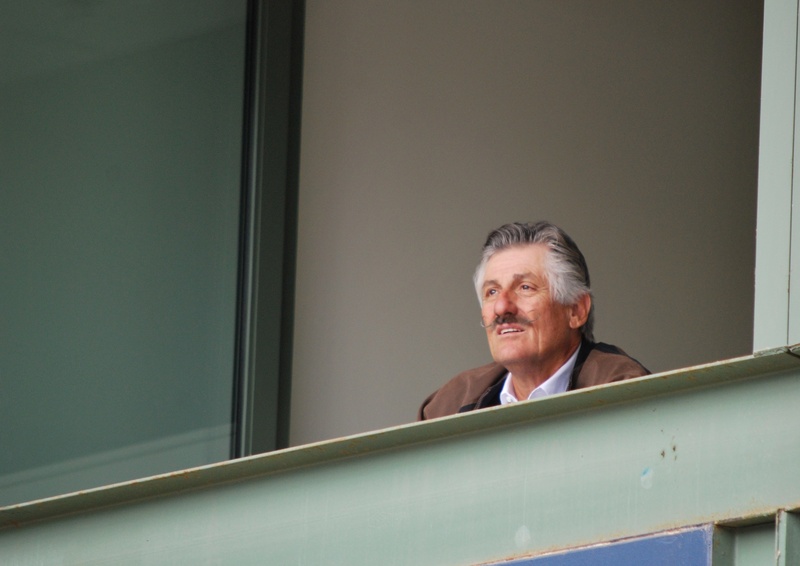 Rollie Fingers! Still sporting the handlebar mustache. After doing a quick Wikipedia search, I learned that he had originally grew the mustache to get a $300 bonus from then Oakland Athletics owner Charles Finley. Fingers pitched for the Brewers from 1981 to 1985, and won the AL MVP and Cy Young Awards during the 1981 season. 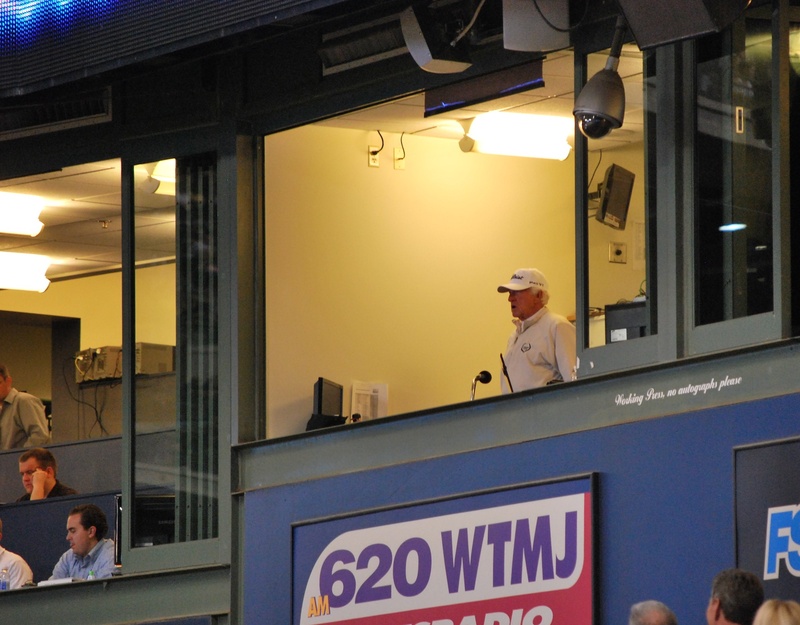 If he hadn’t torn a muscle in his arm and was available for the 1982 Fall Classic, the Brewers may very well be the owners of a World Series trophy. 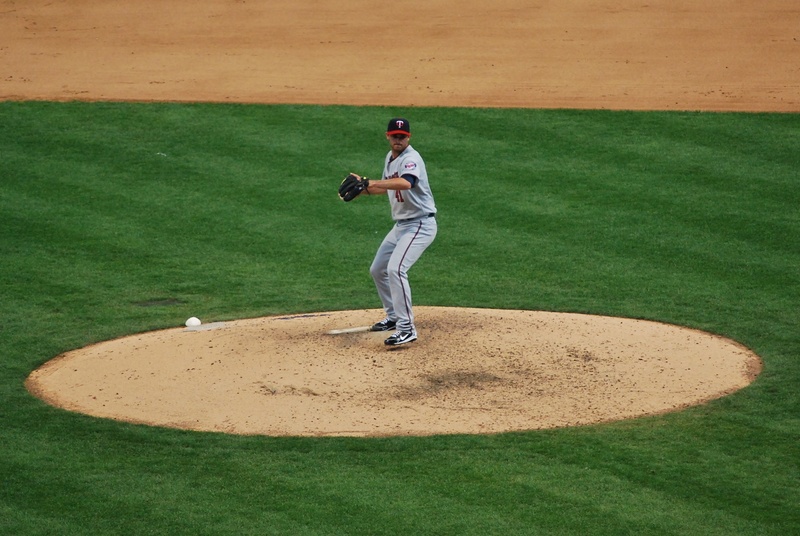 The game stayed tied at one a piece until the bottom of the sixth. Lucroy doubled to open the frame, and Braun followed with a single. Ramirez forced Braun out at second, but Lucroy came home with the go-ahead run. Corey Hart doubled, and Ramirez moved to third, leaving first base open. The Cubs thought they would be better off facing the light hitting backup infielder Edwin Maysonet (hmmmmm) and walked Ishikawa to get to him. On the second pitch Maysonet hit a Grand Slam to left field, and the Brewers grabbed control of the game with a 6-1 lead. 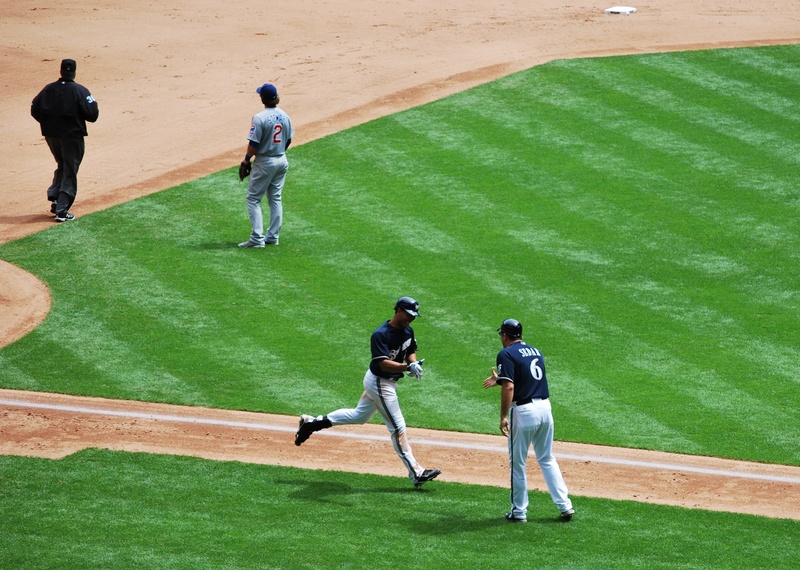 Here’s Maysonet as he prepares to get a congratulatory hand shake from Brewers third base coach Ed Sedar. The Cubs put one on the board in the eighth, but the Brewers answered with two of their own in the bottom half, and that was all the scoring. Final Score: Brewers 8 – Cubs 2. More handshakes and high fives followed the victory. It was a great win for the Crew, a great outing from Marcum (7 ip, 3 H, 1 ER, 2 BB, 6 K), and a “salami” from an unexpected source. 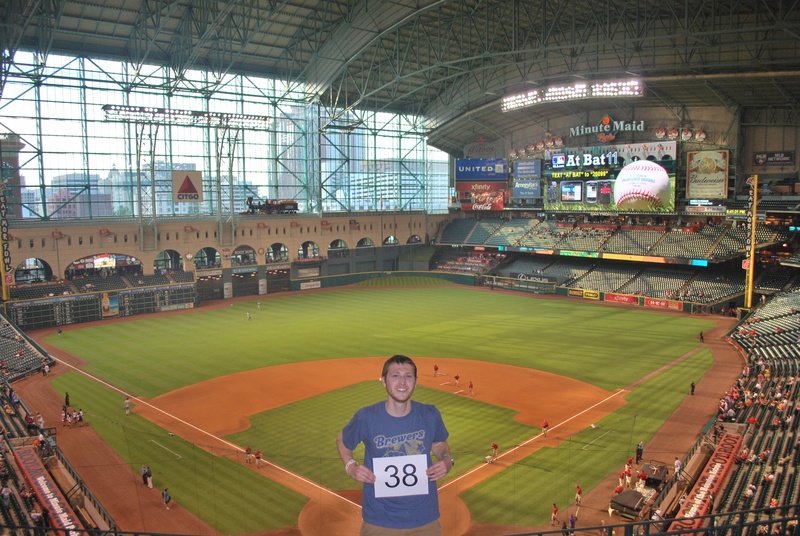 After waiting for the concourse to clear we went up to section 436 to get the game number picture. Just a few more games and I’ll be moving down to the loge (2nd) level and doing the same gradual progression around the stadium. On our way back to the car we noticed something strange. From a distance we could see two people standing on the roof of a white van, but we couldn’t make out who. When we got closer we realized that they were young girls, I would say between 7 and 10 (I’m terrible with ages now). They were both standing up there, and when we were walking past, the adults were throwing things up there for them to catch (I think it was bottle caps). Now, I’m no parent, but I don’t think I’d want my kids on the roof of a van, when it would be pretty easy to slip or stumble off. Even though it may look like it, Crandall (pictured in white on the right) is not relieving himself next to the van. Mother’s day is tomorrow and I’m taking my mom to the game. A good time should be had by all.